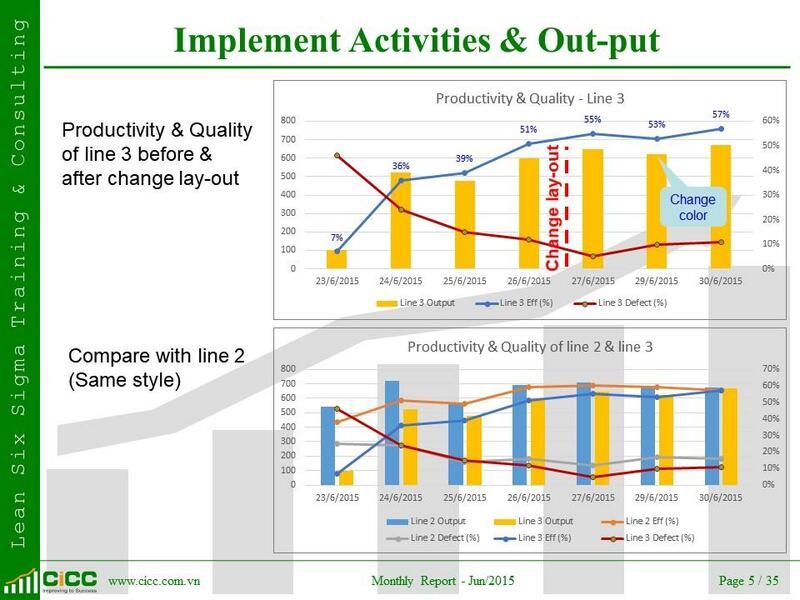 Develop and implement improvement activates with balanced roadmap. 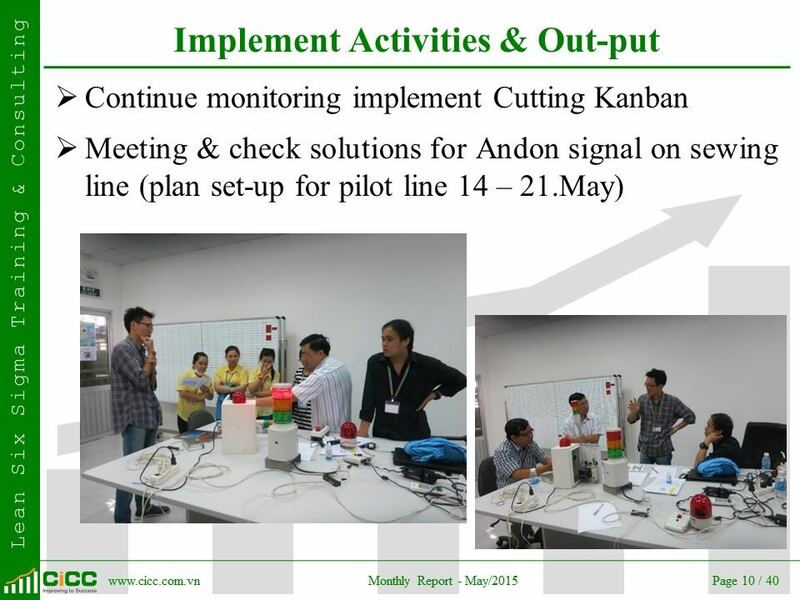 Monitor progress on the site and do on the job training/coaching. 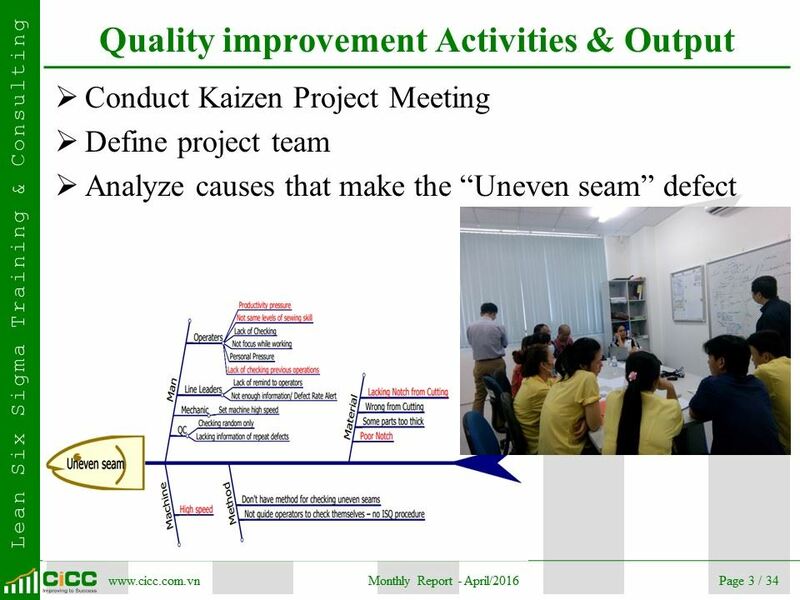 Our consulting approach includes analyzing the current situation; identifying the problem and then applying Lean tools to solve each problem in order to achieve specific improvement’s goals in consistency with the agreement of both parties before project starts. 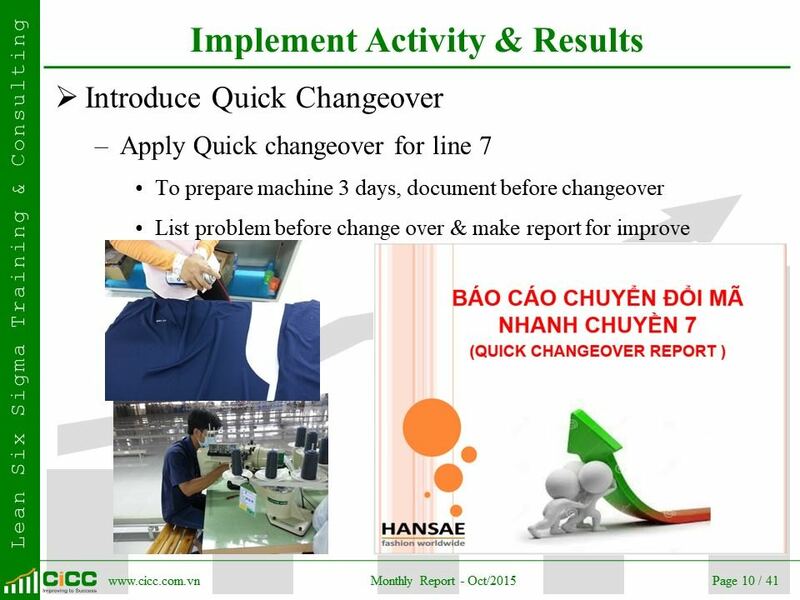 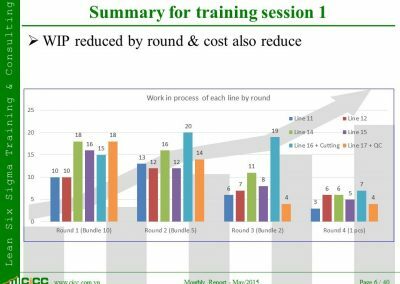 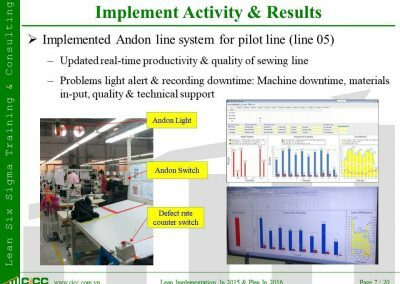 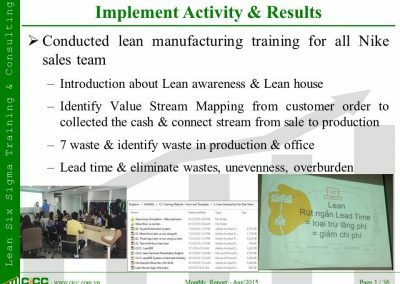 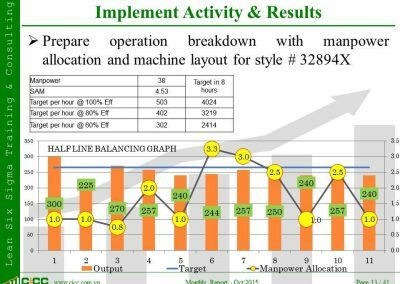 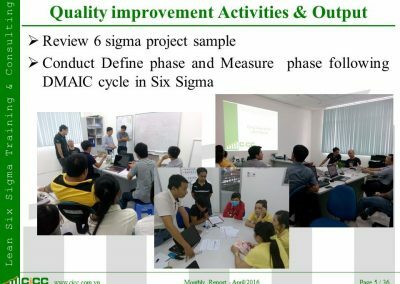 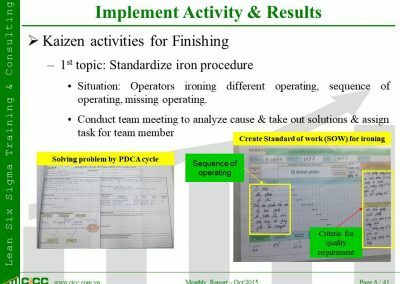 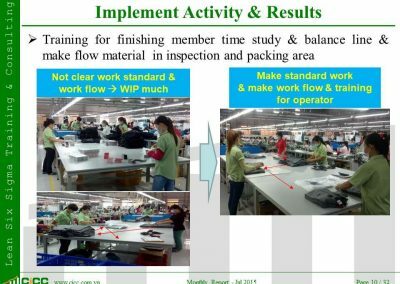 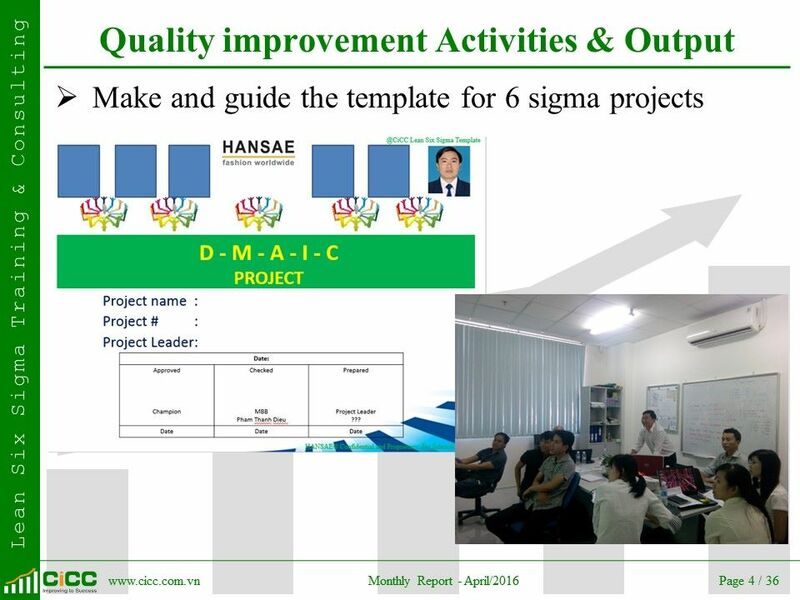 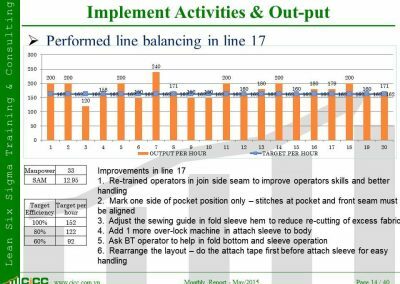 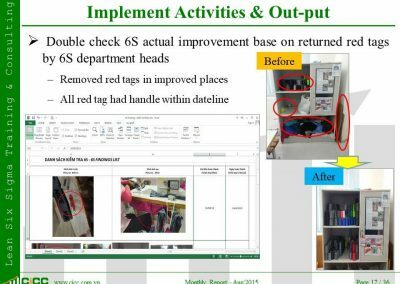 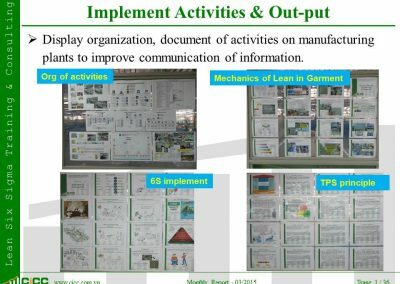 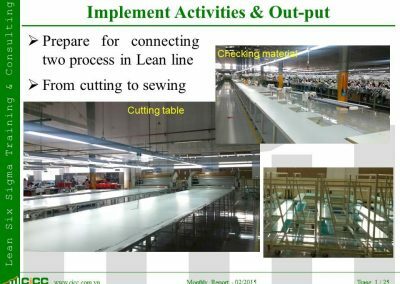 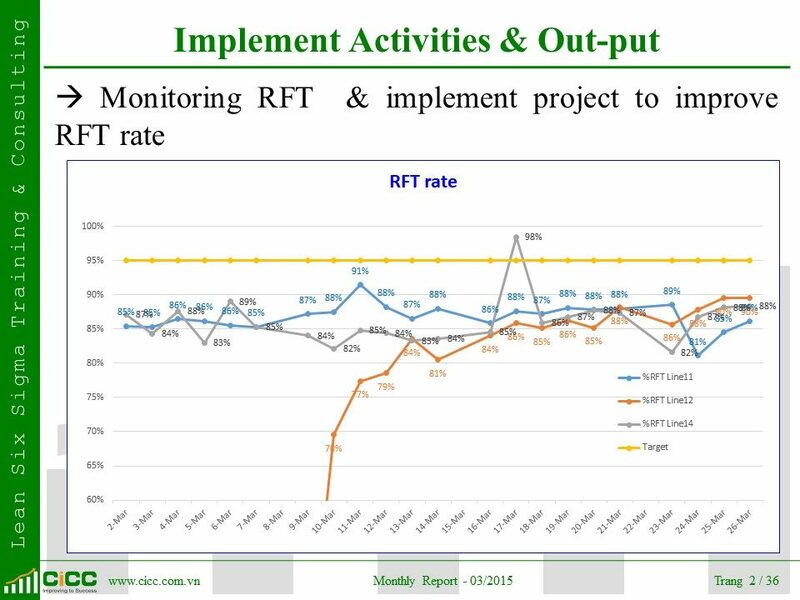 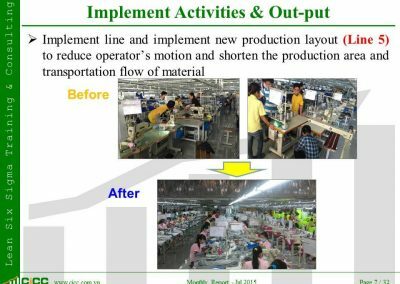 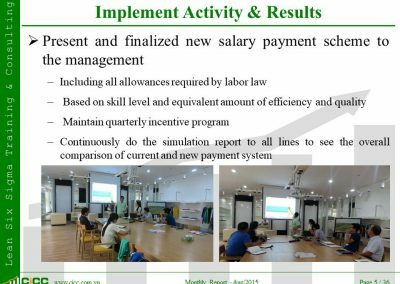 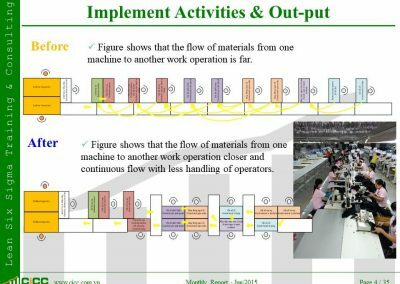 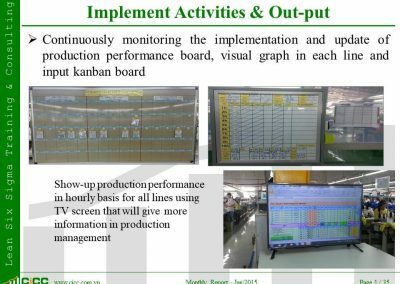 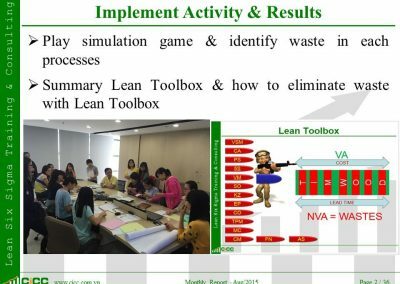 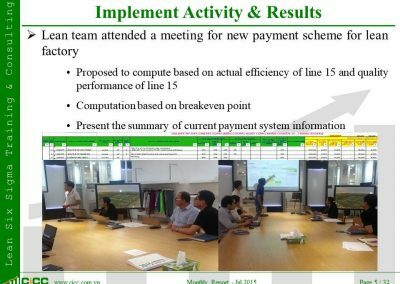 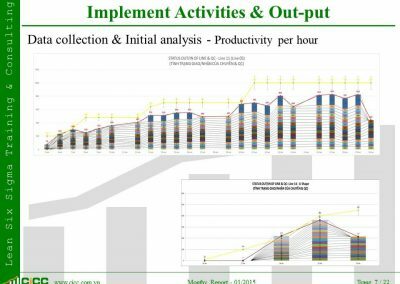 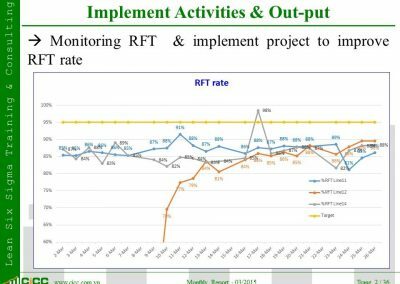 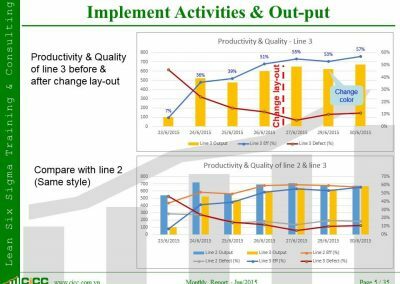 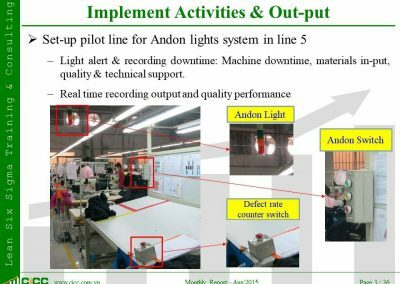 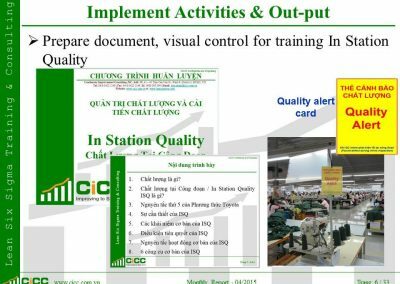 The goals of project are wastes reduction, processes variation reduction, productivity and quality improvement, and cost saving. 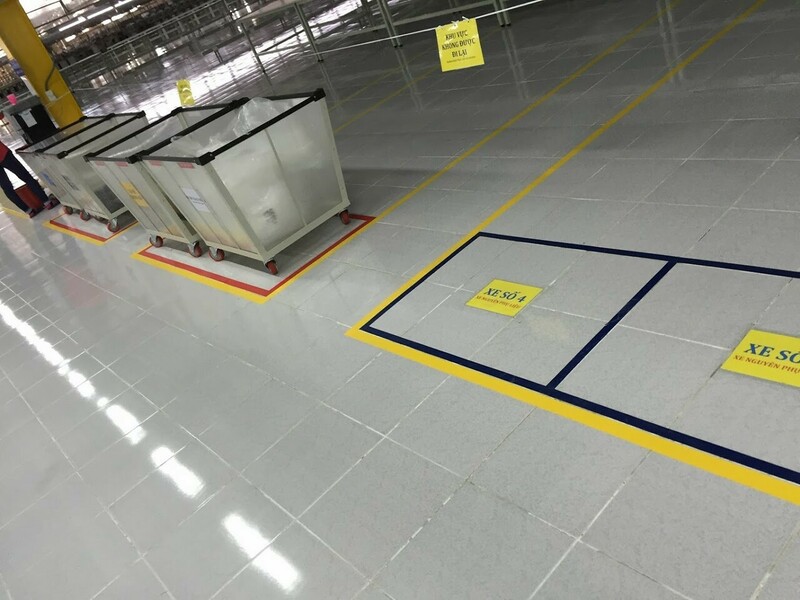 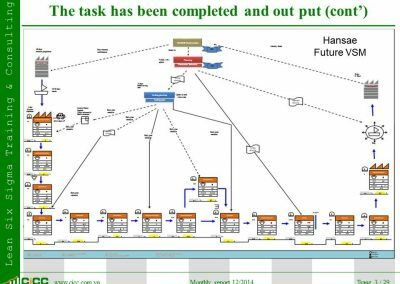 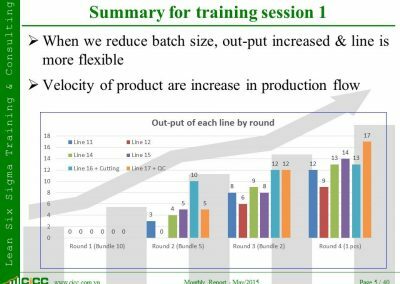 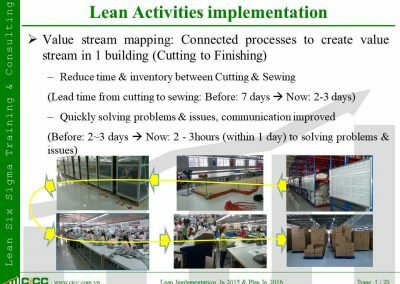 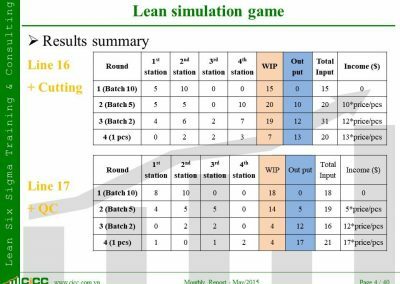 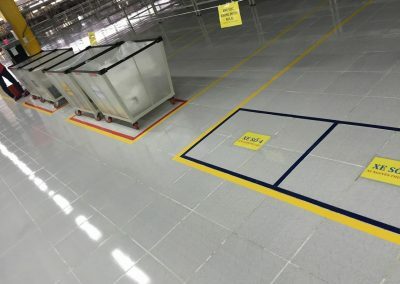 Our method is not only set the boundary of the current state but also show your company how to prepare future’s expectations and assess the progress of Lean implementation. 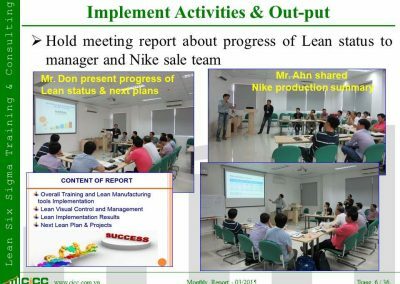 We try to support your company to have ownership in improvement by developing a desire for change and ability to change in the organization. 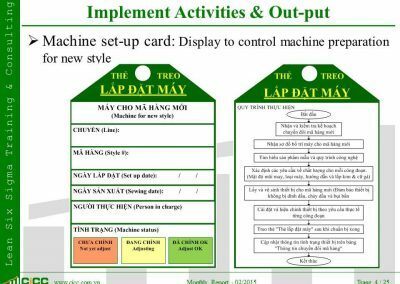 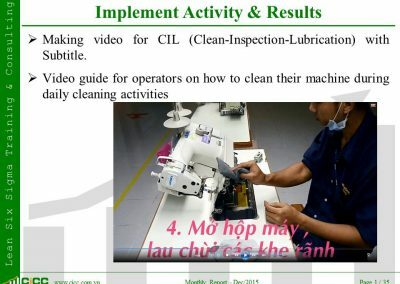 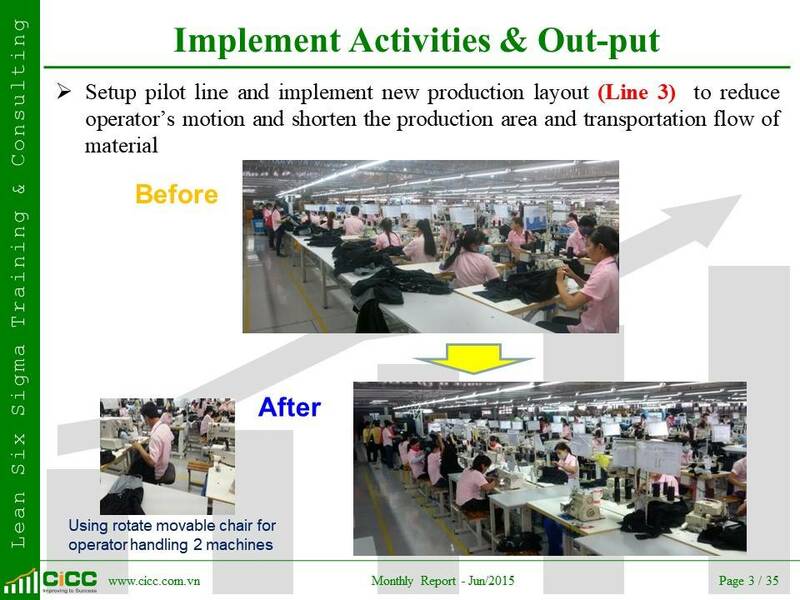 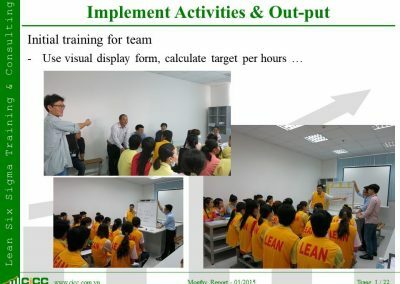 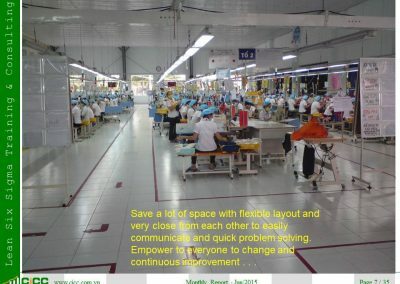 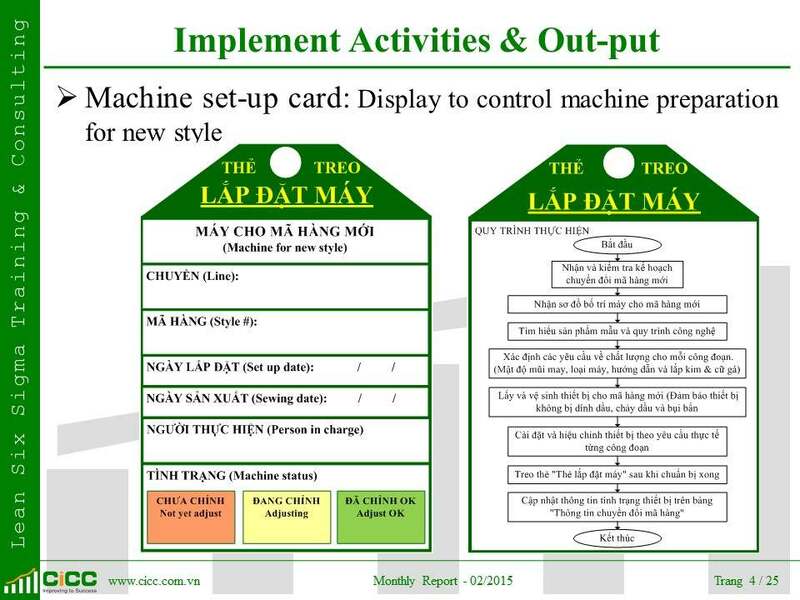 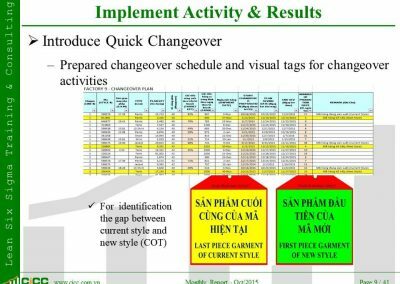 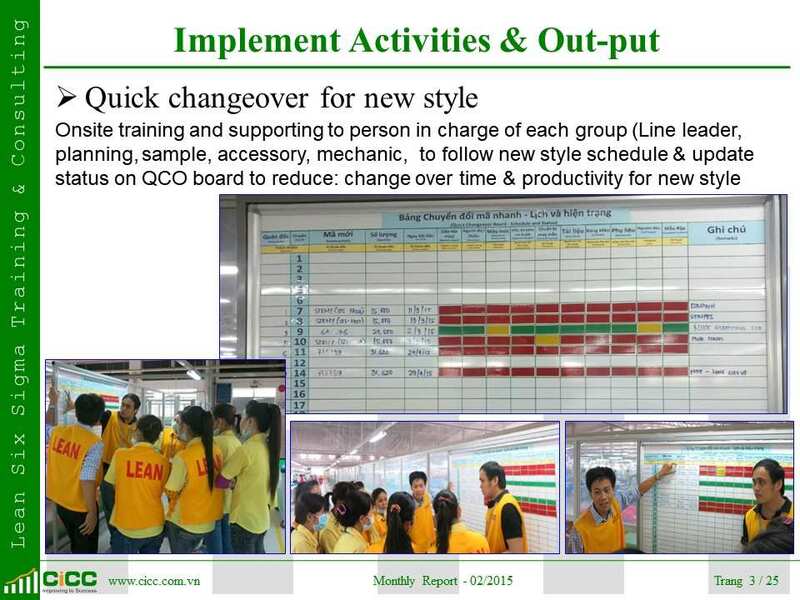 Then we provide a set of Lean tools and techniques to make such changes happened. 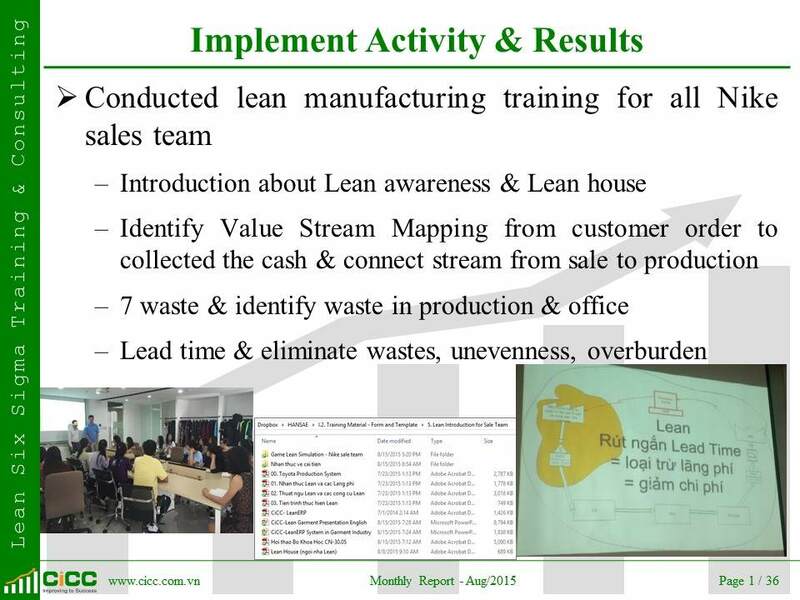 To sustain the results, your company must do it for yourself – no one else can do it for you company. 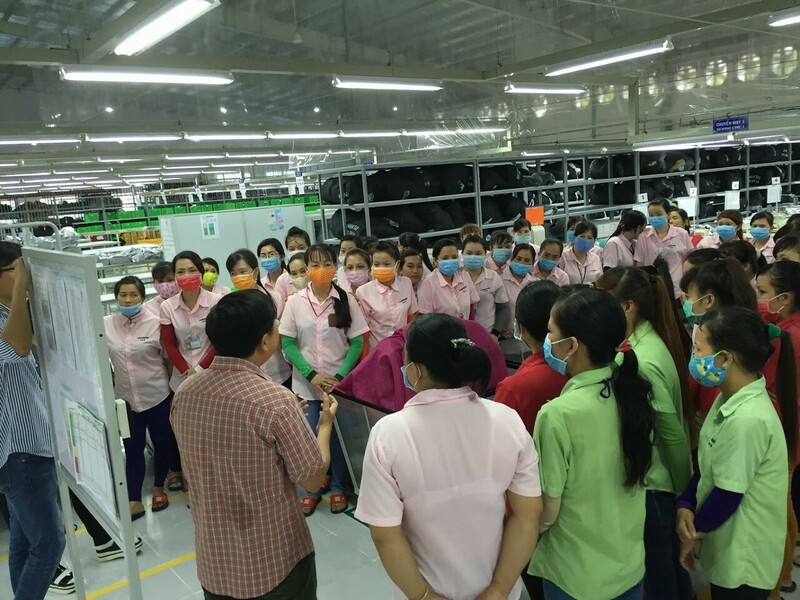 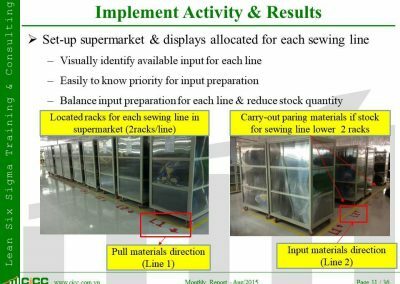 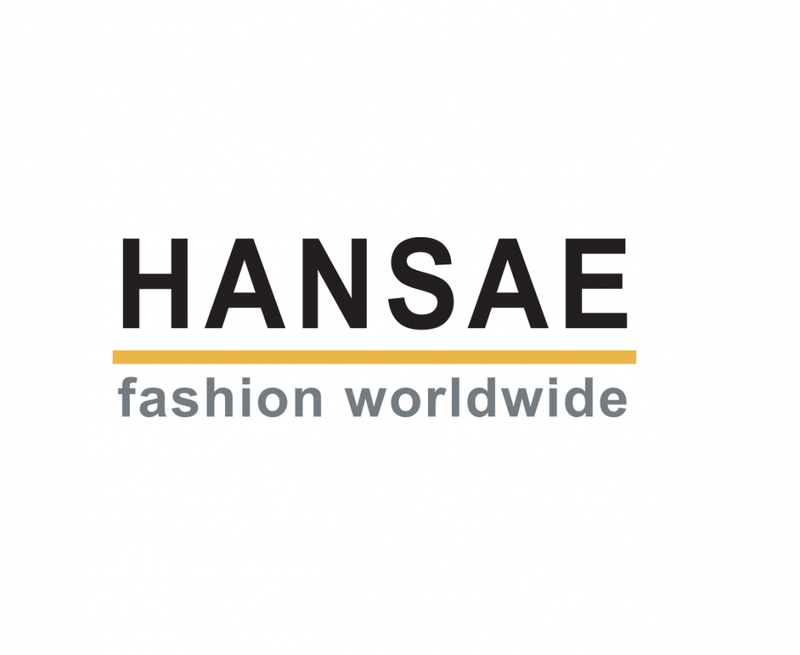 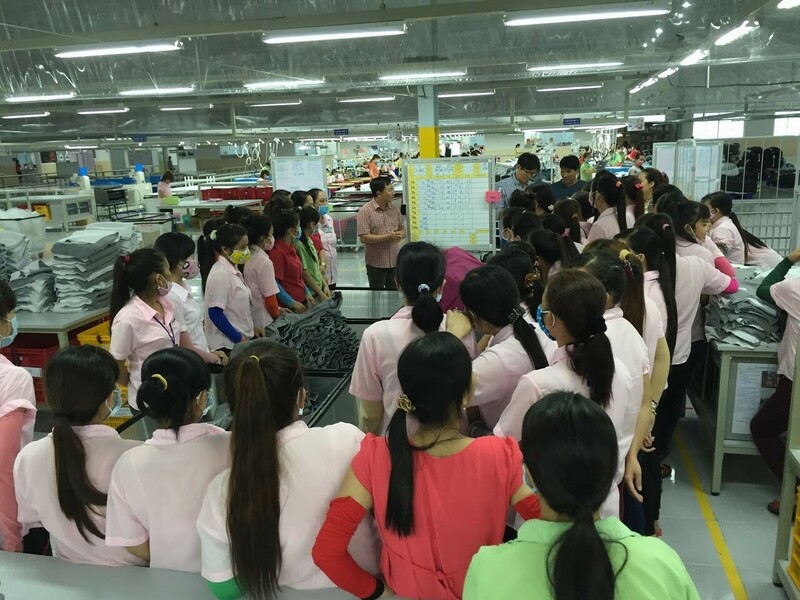 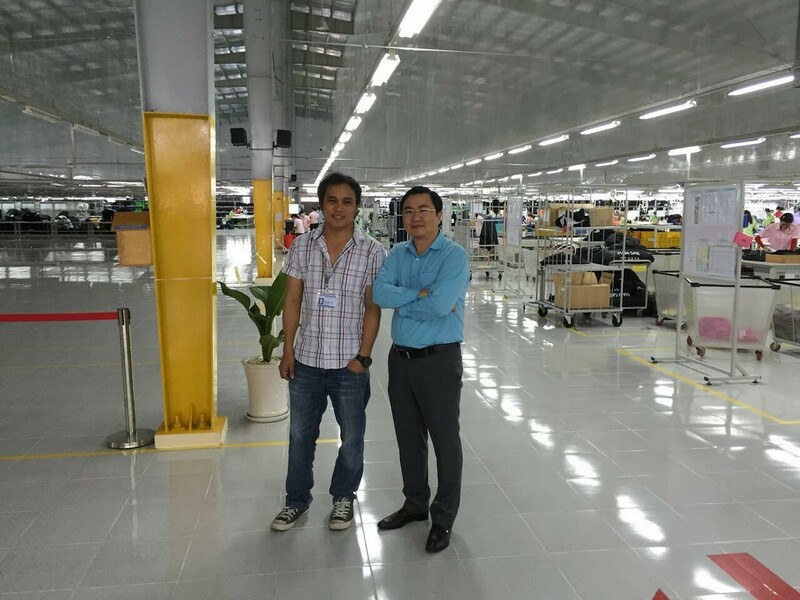 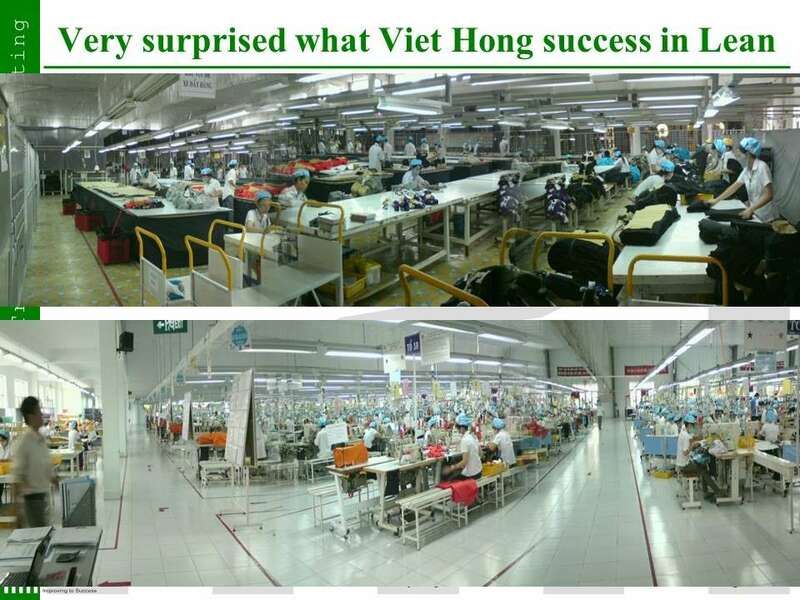 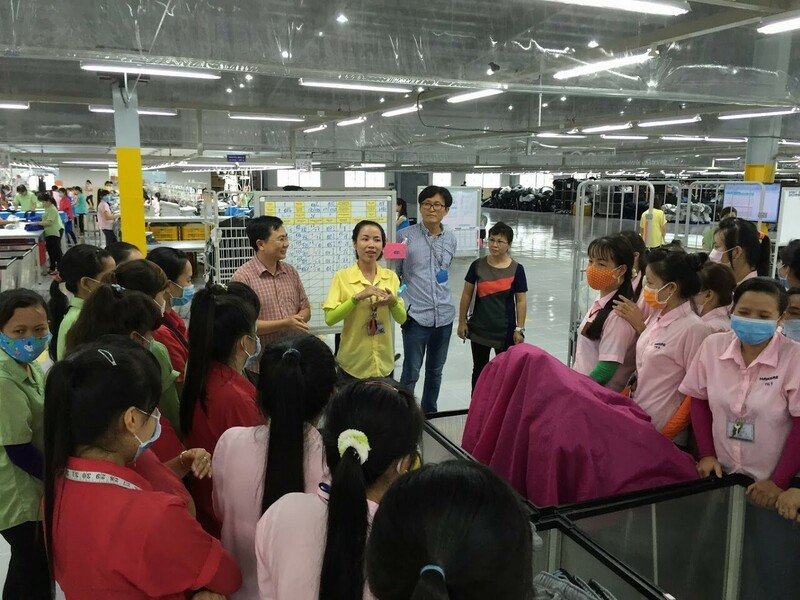 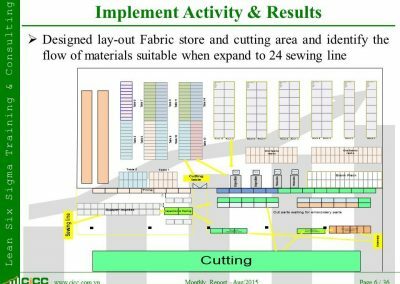 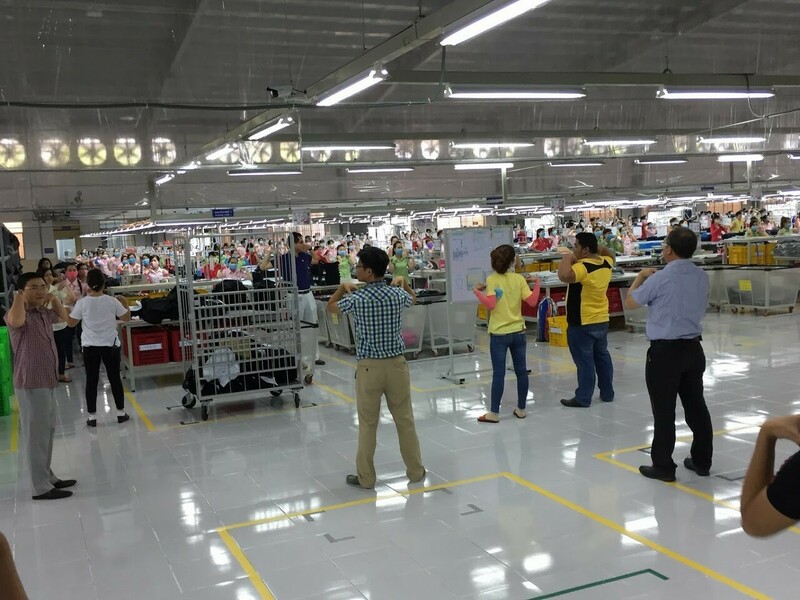 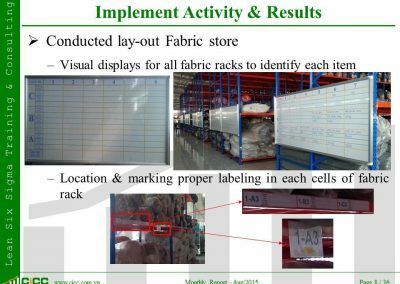 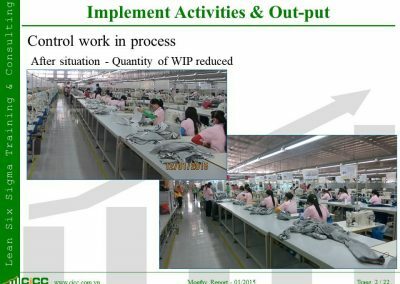 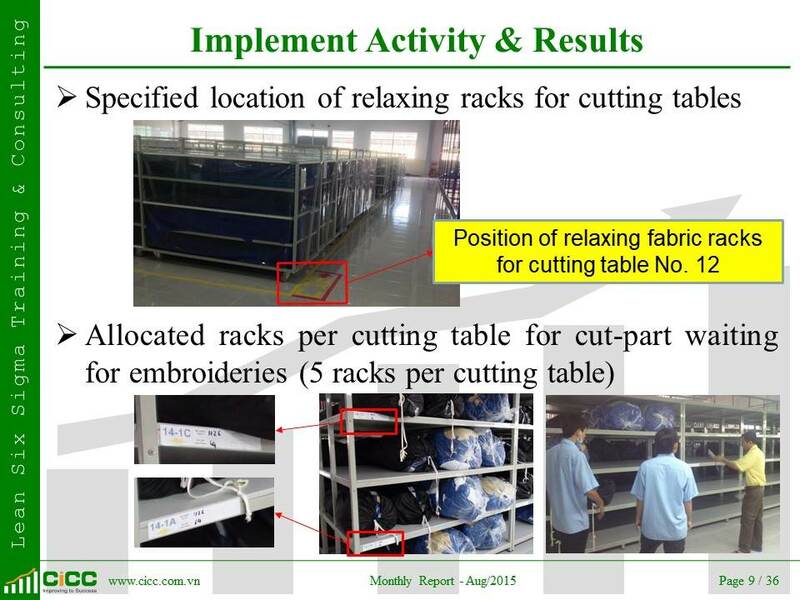 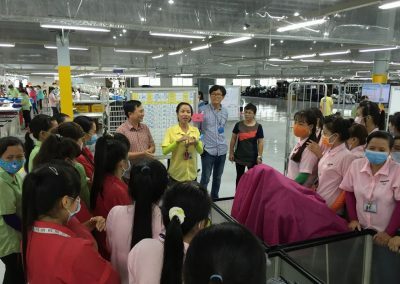 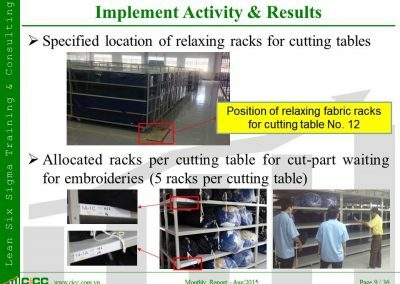 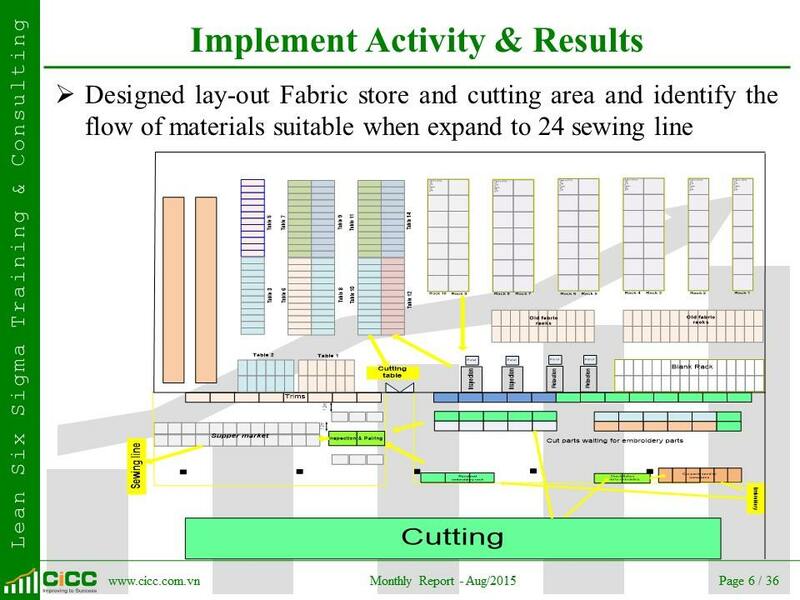 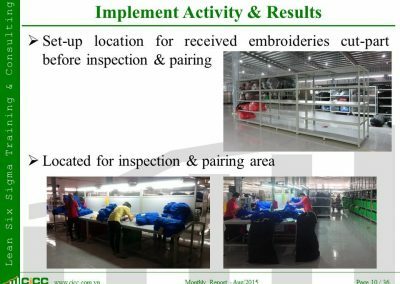 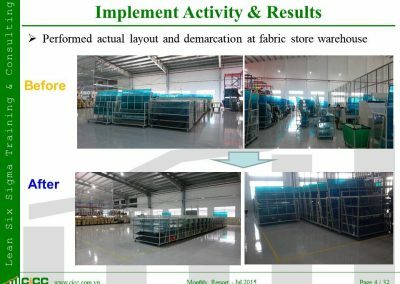 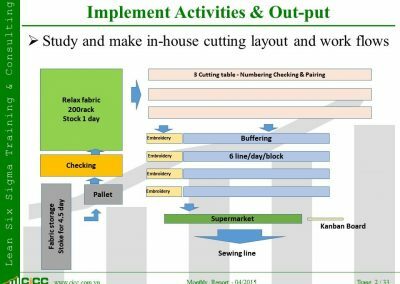 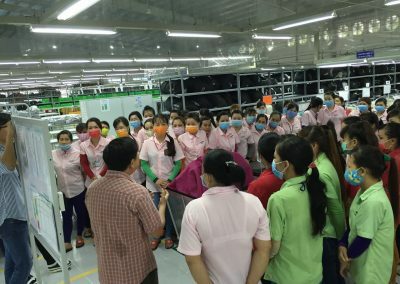 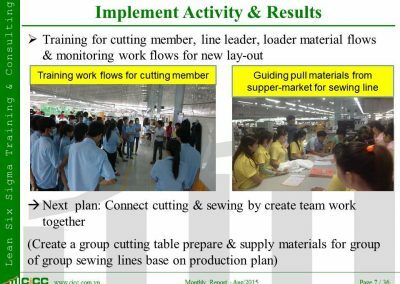 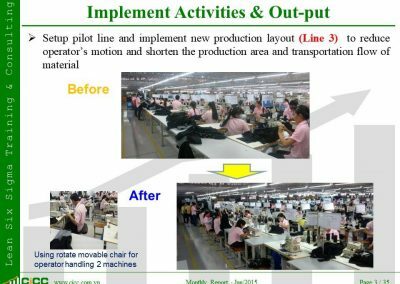 In garment industry, there are 5 to 7 key processes such as Product development, raw materials, planning, production and delivery. 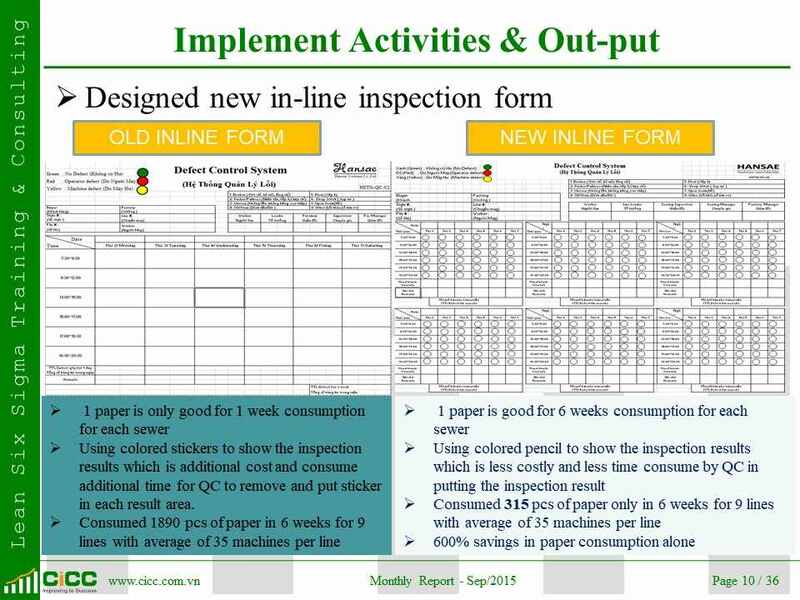 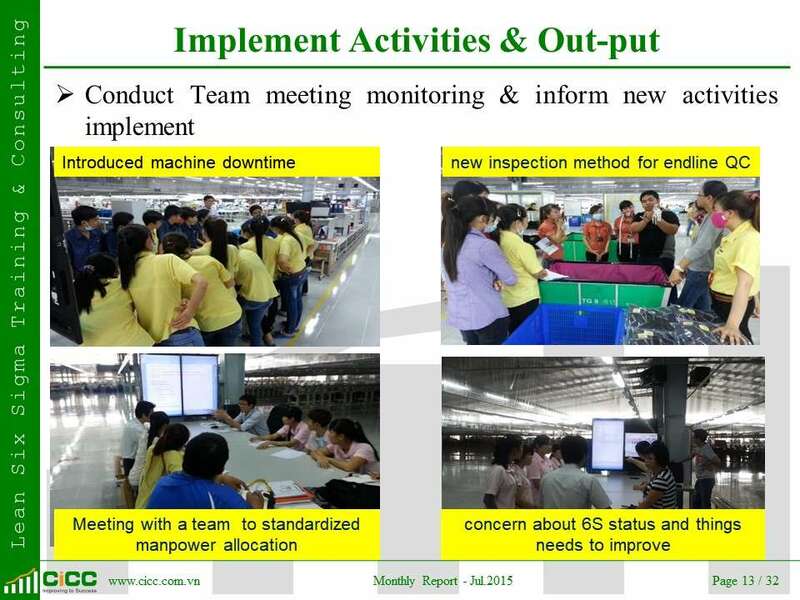 These process will be analyzed and identify issues/ problems that need improvement. 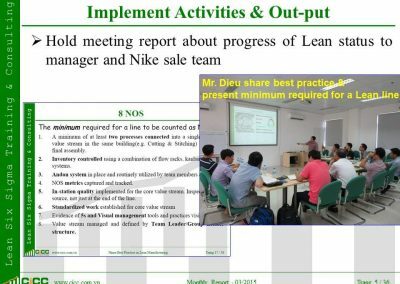 Since then, the most important and potentially effective goal will be determined (On the basis of ability to perform with your company’s resources and time to project). 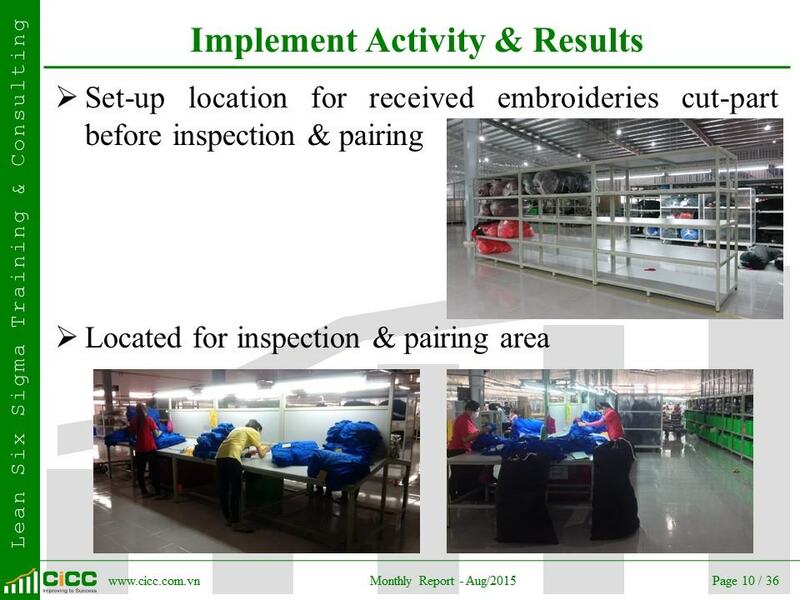 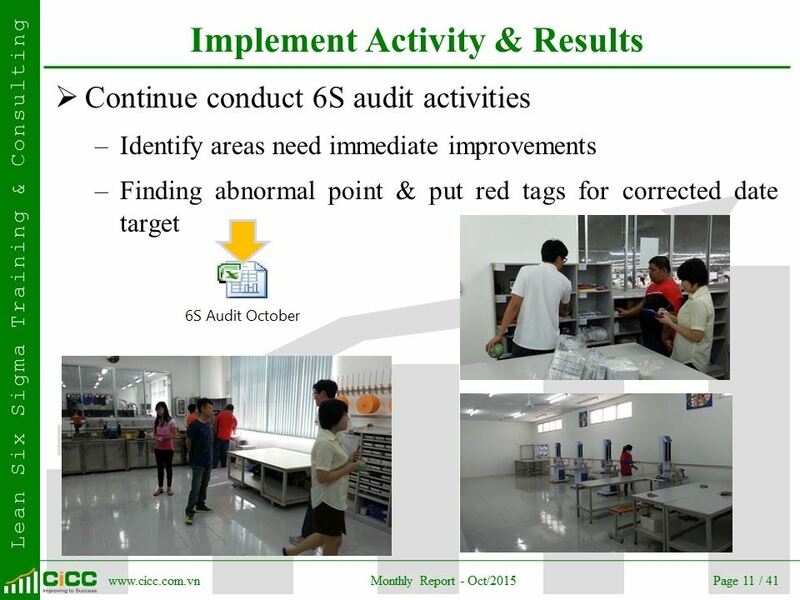 3.5 Validate information by actual checking of the processes. 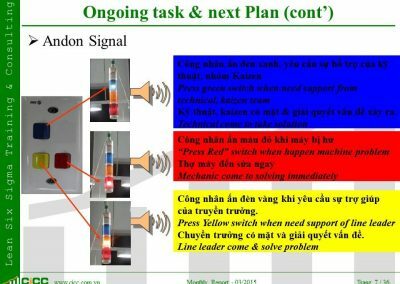 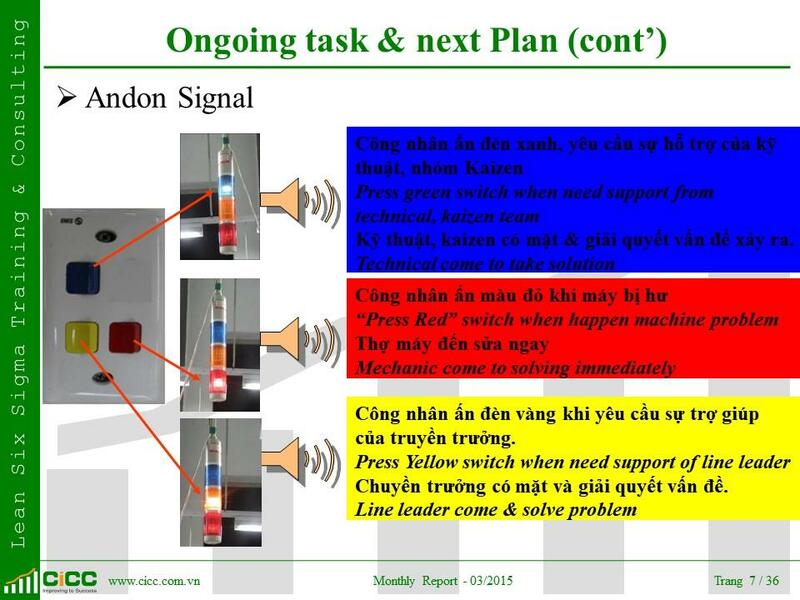 3.10 Communicate with pilot line key members for confirmation. 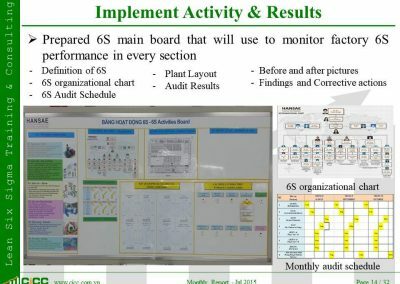 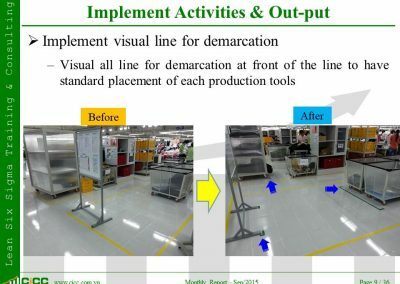 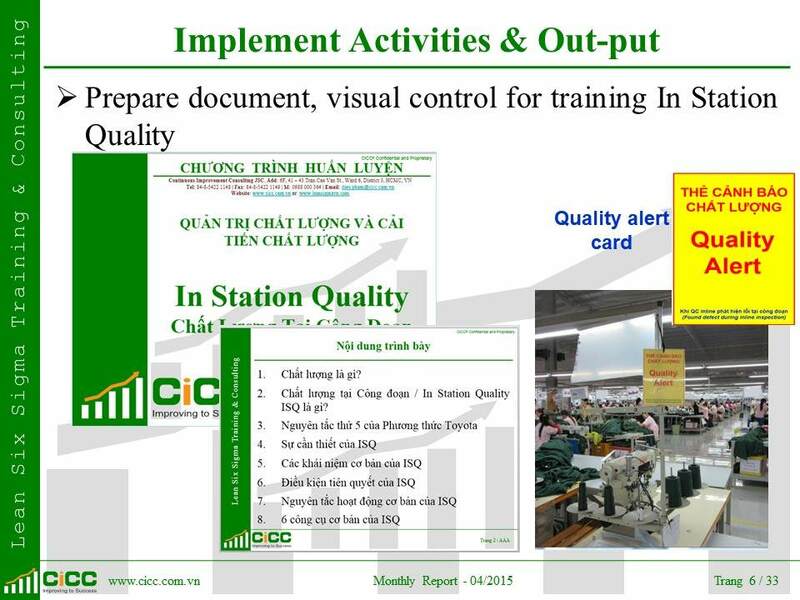 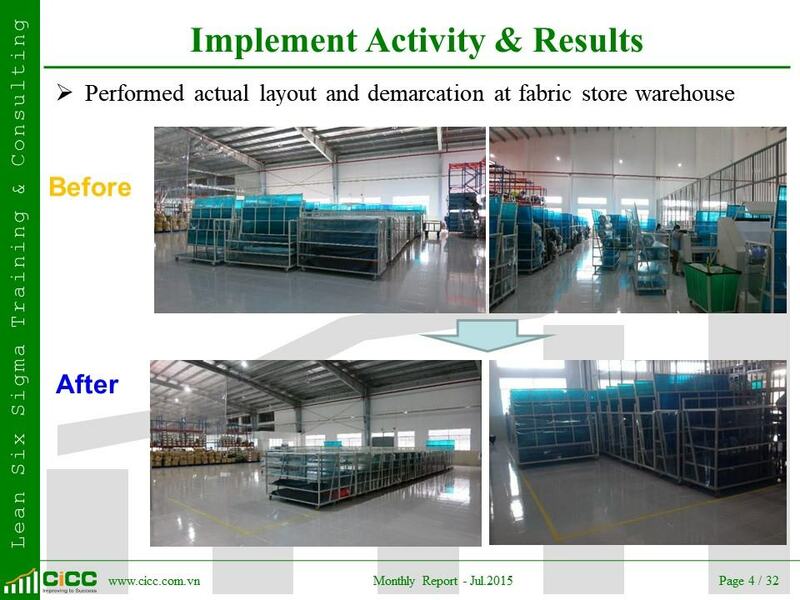 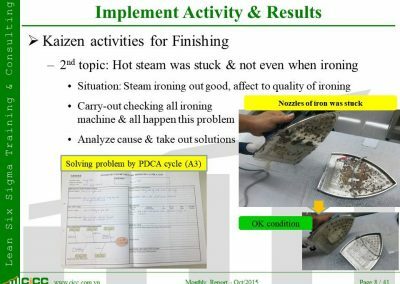 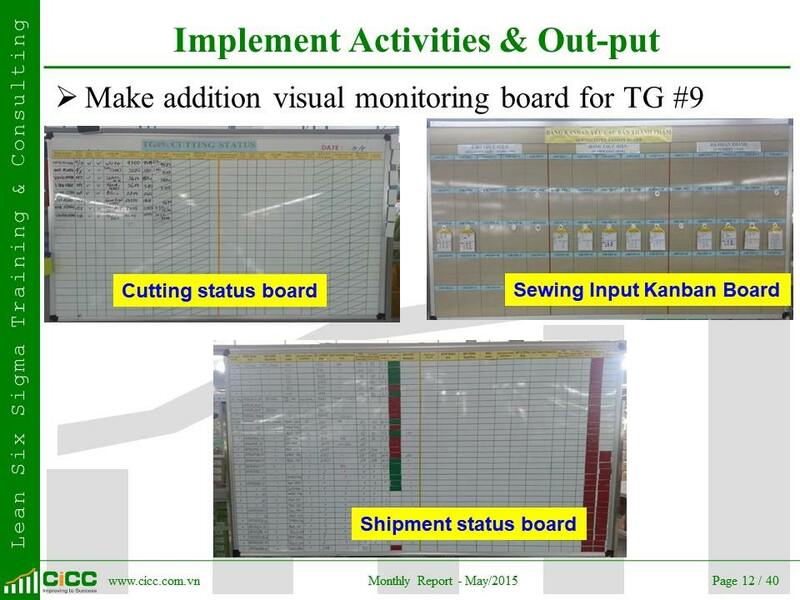 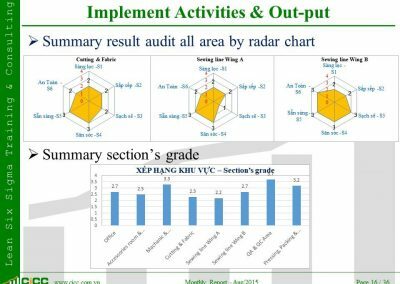 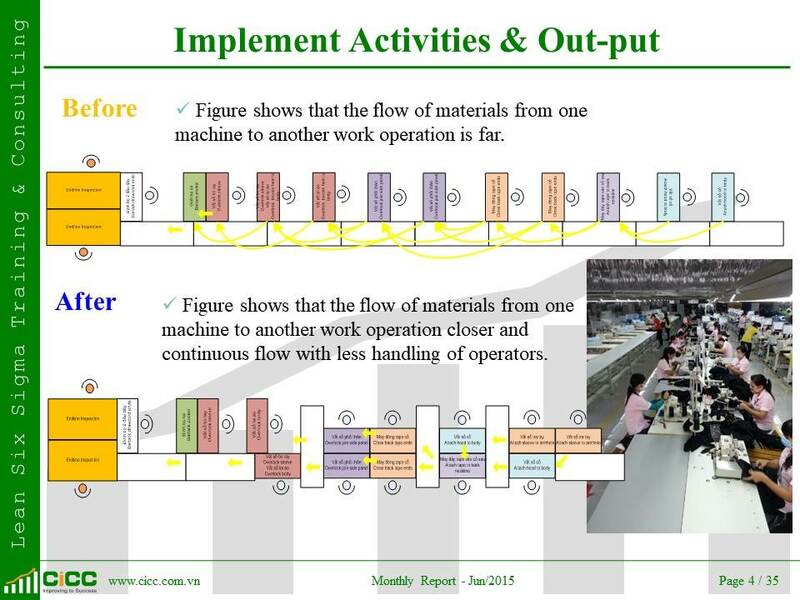 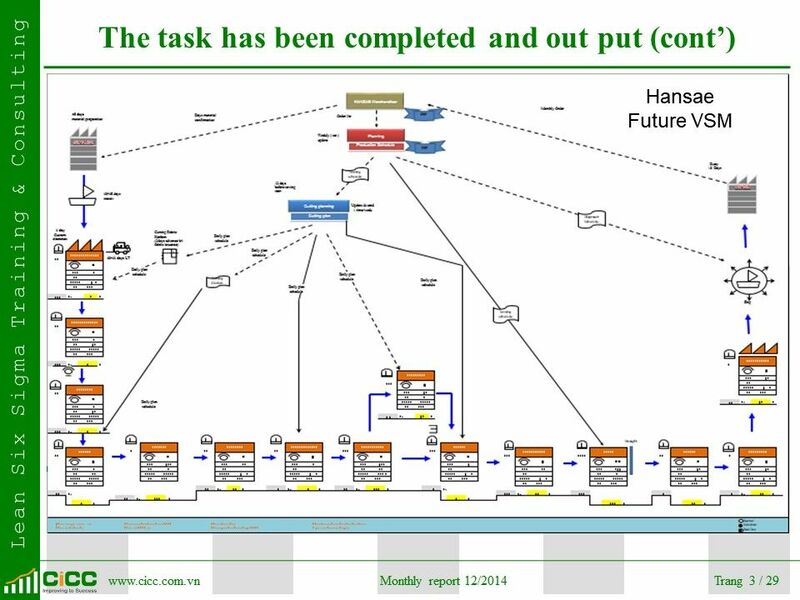 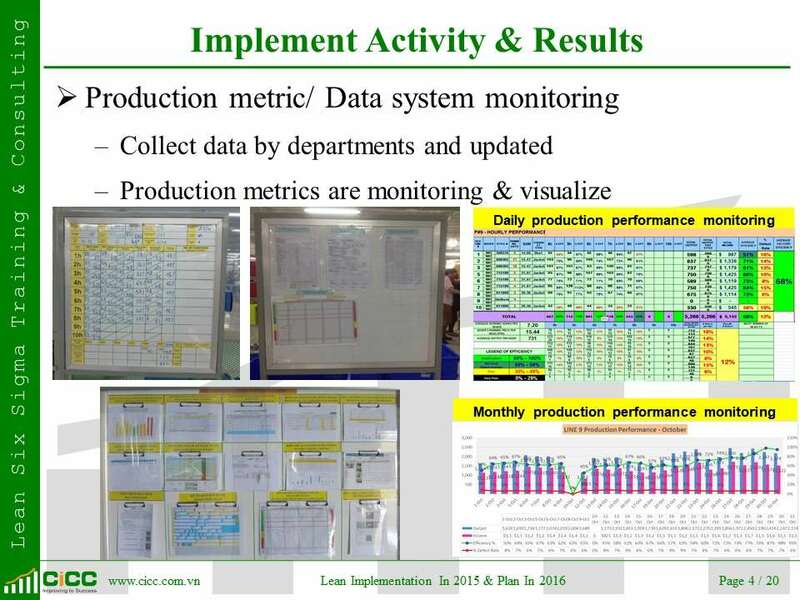 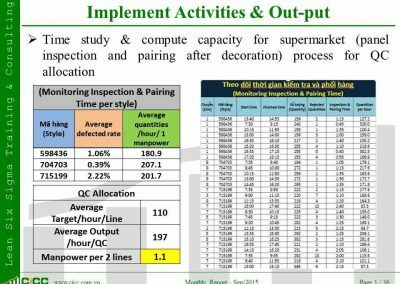 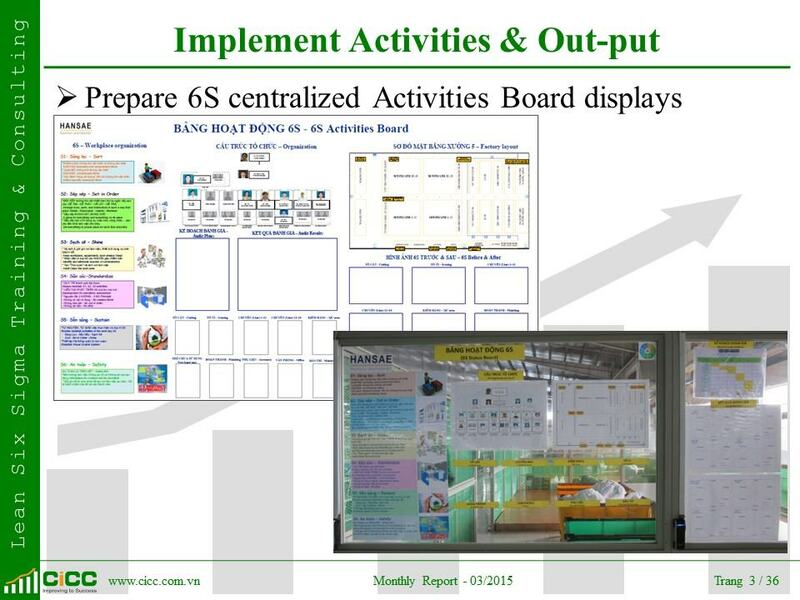 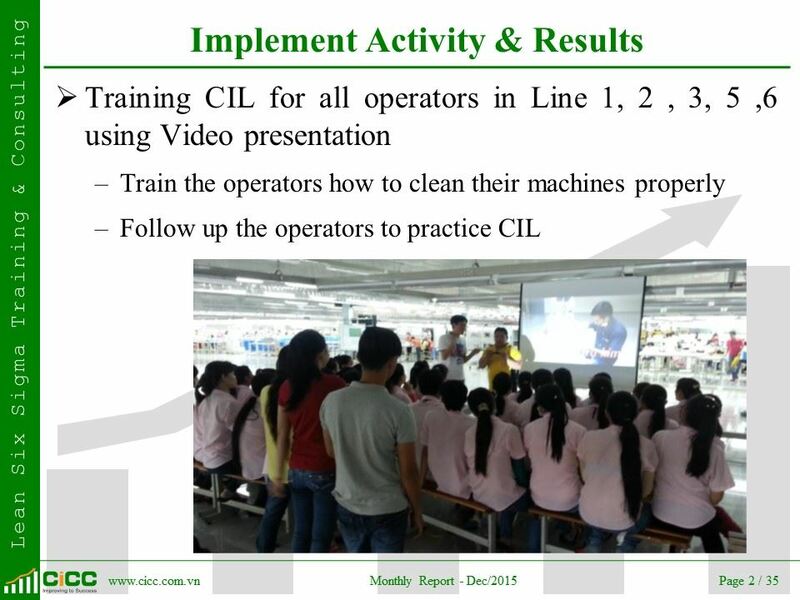 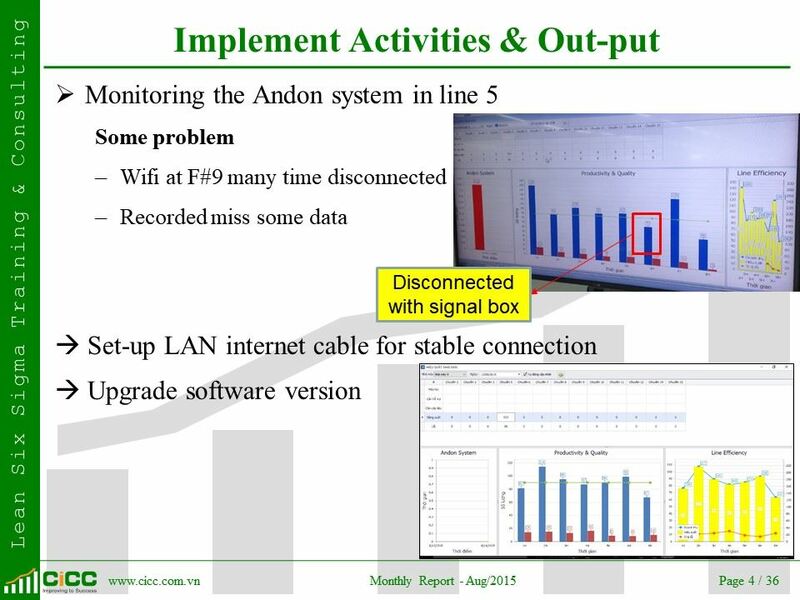 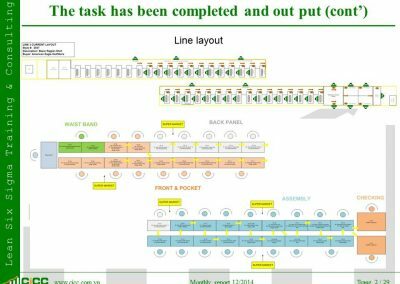 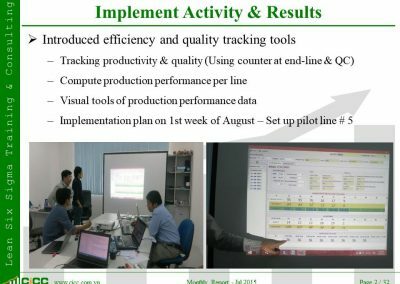 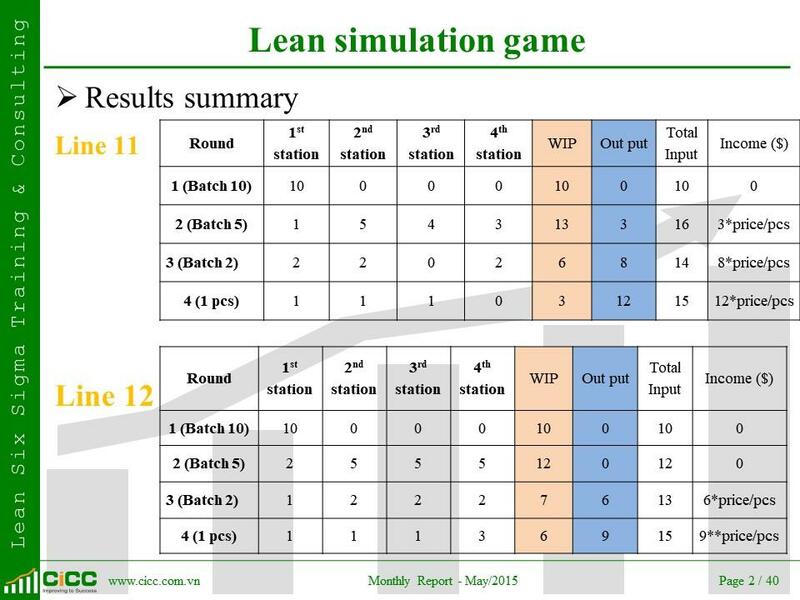 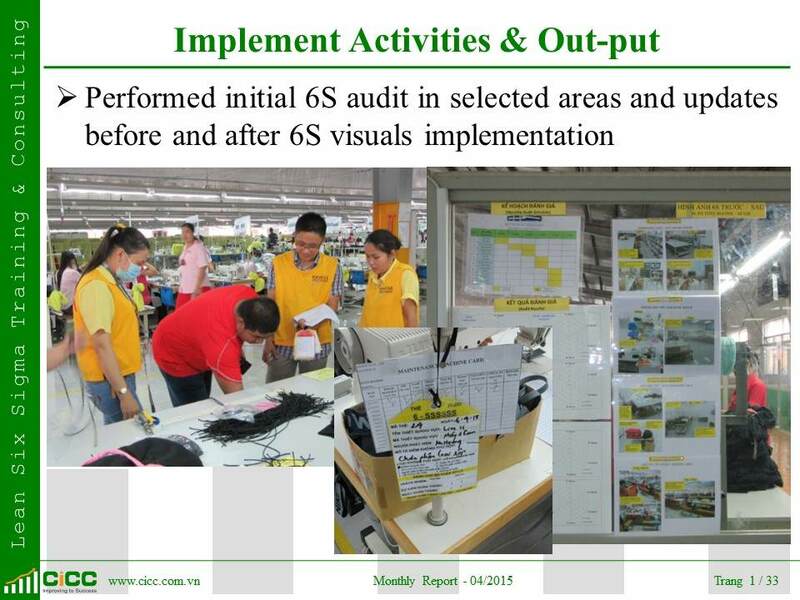 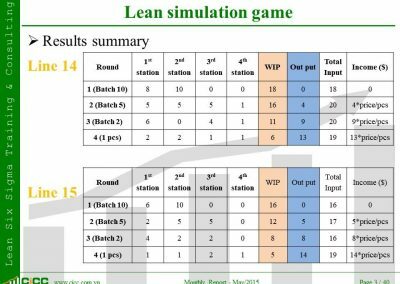 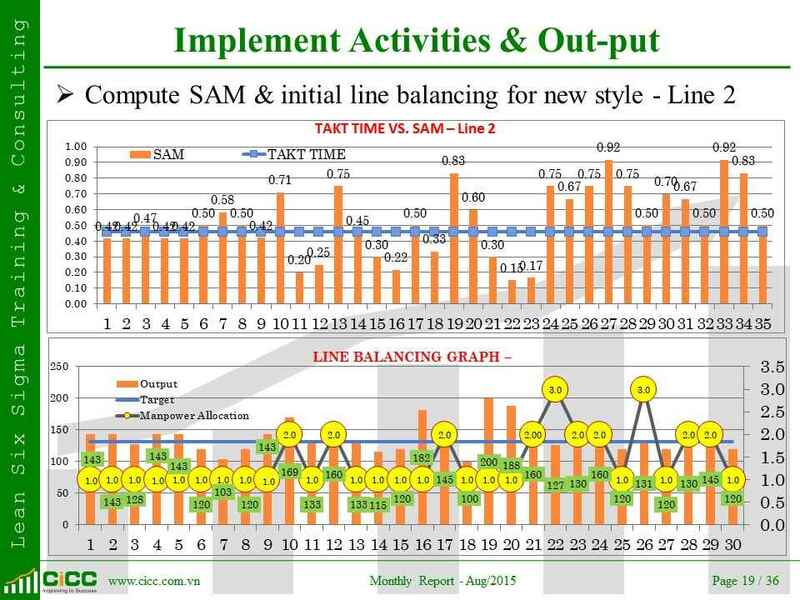 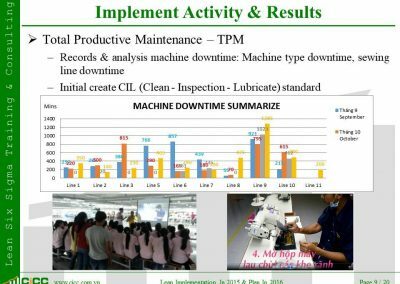 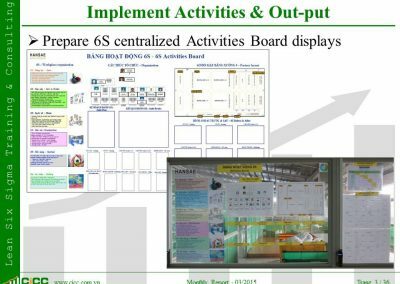 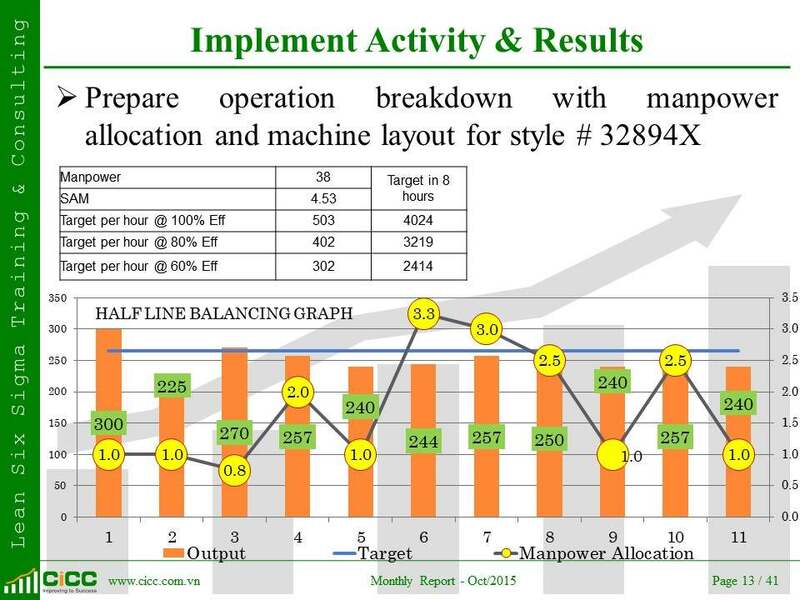 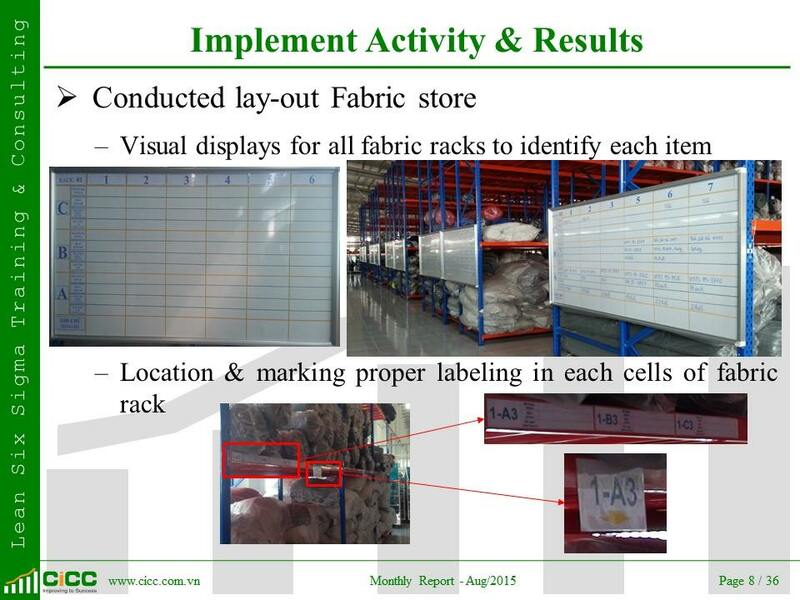 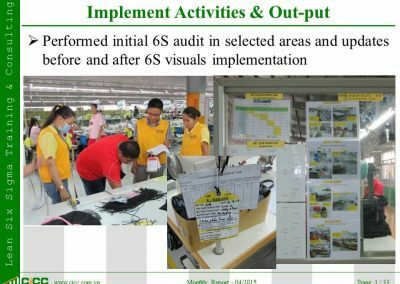 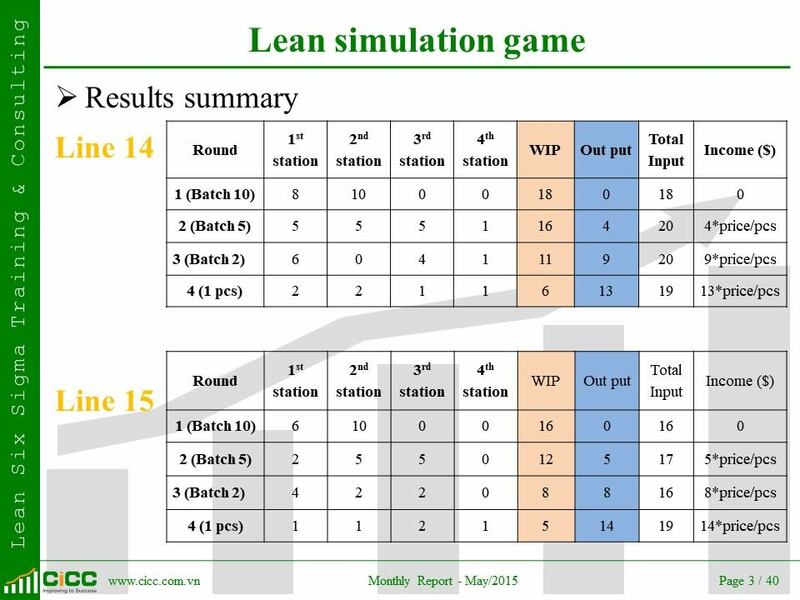 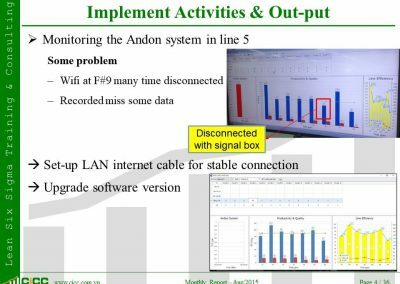 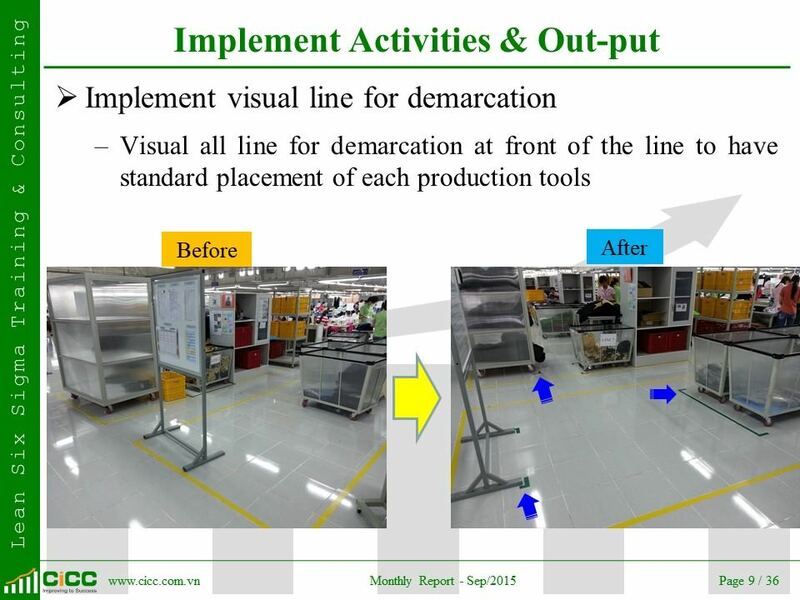 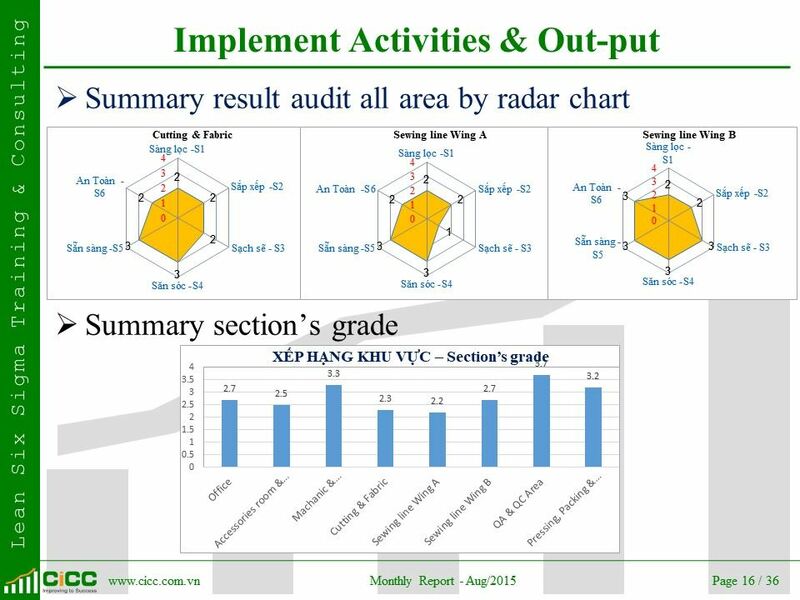 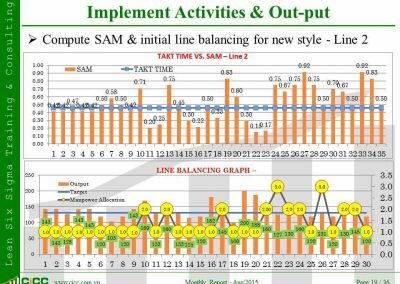 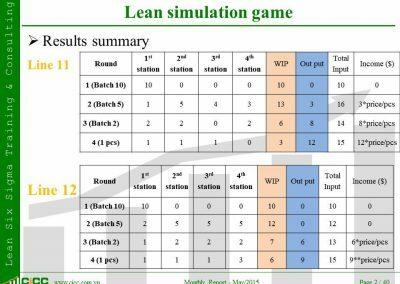 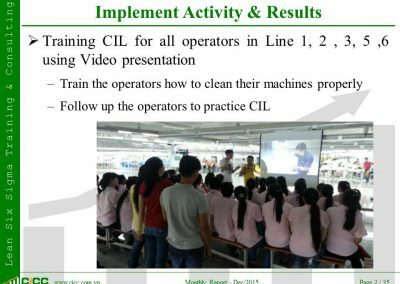 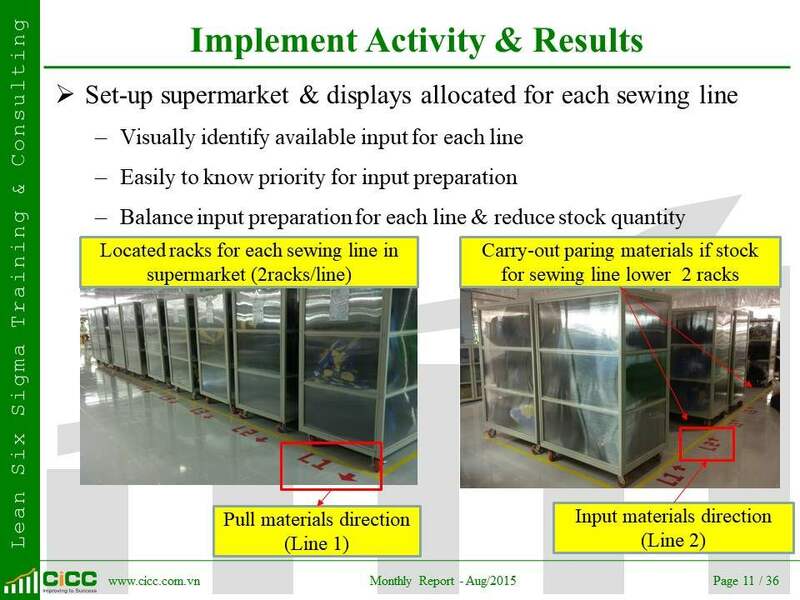 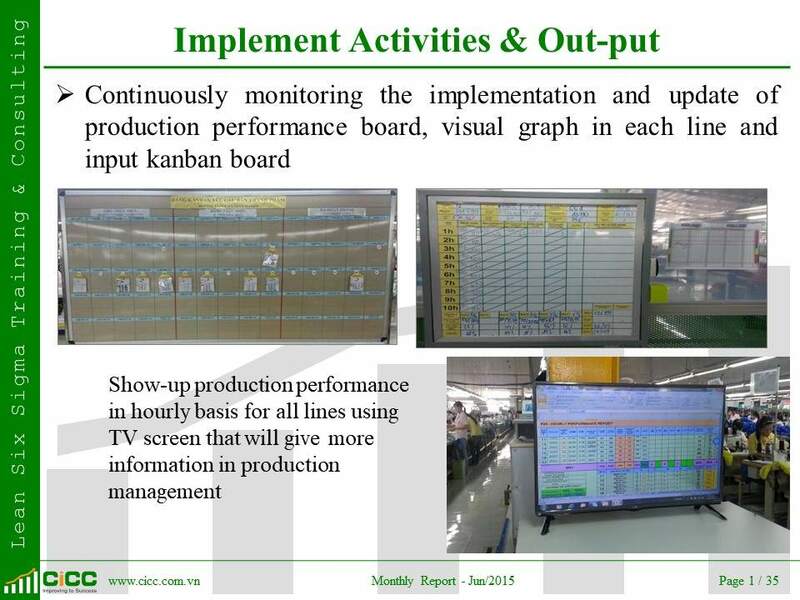 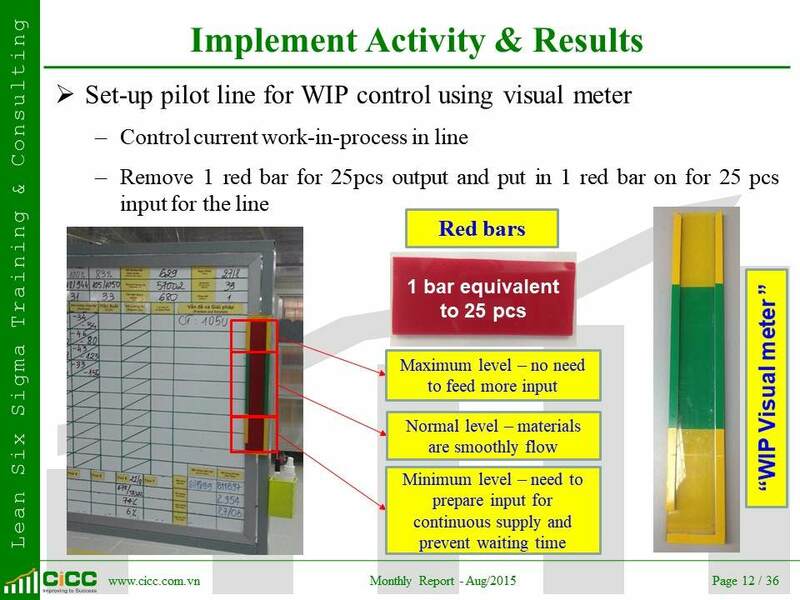 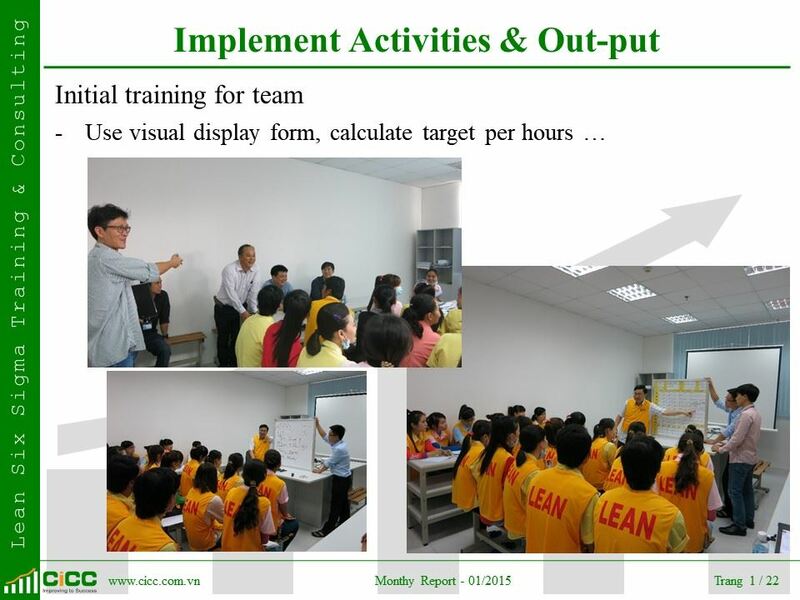 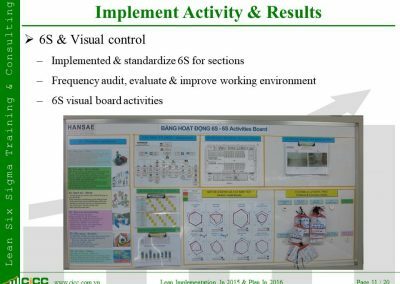 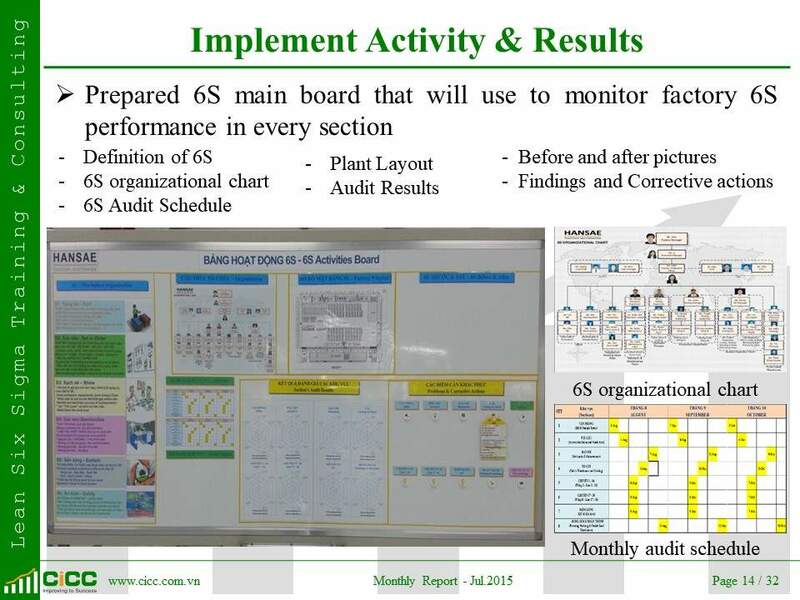 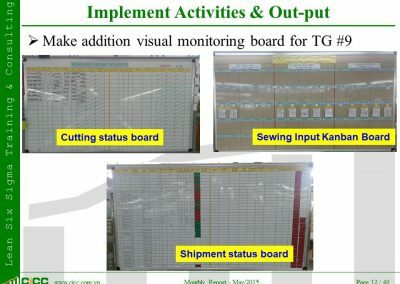 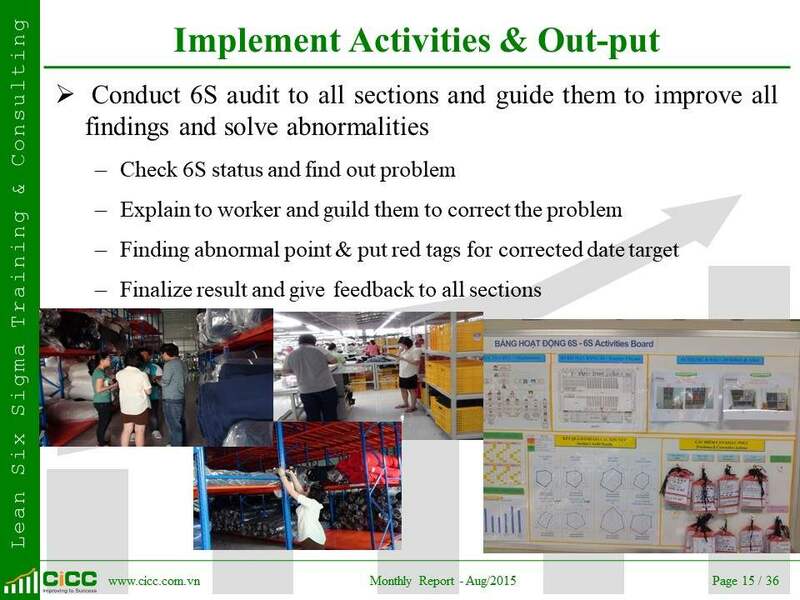 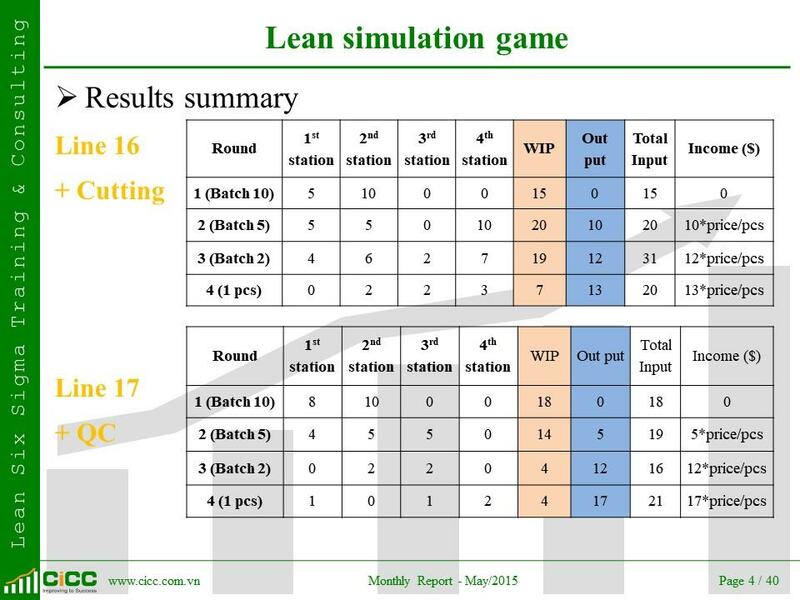 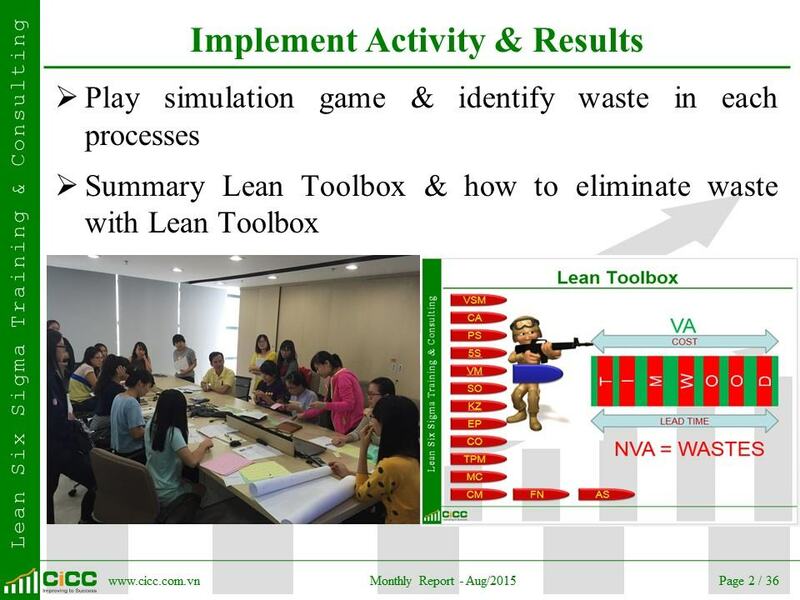 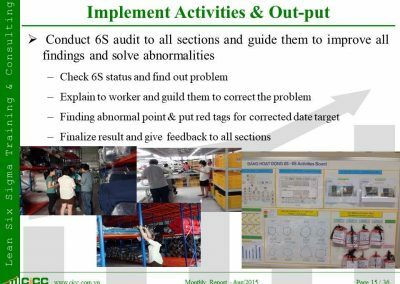 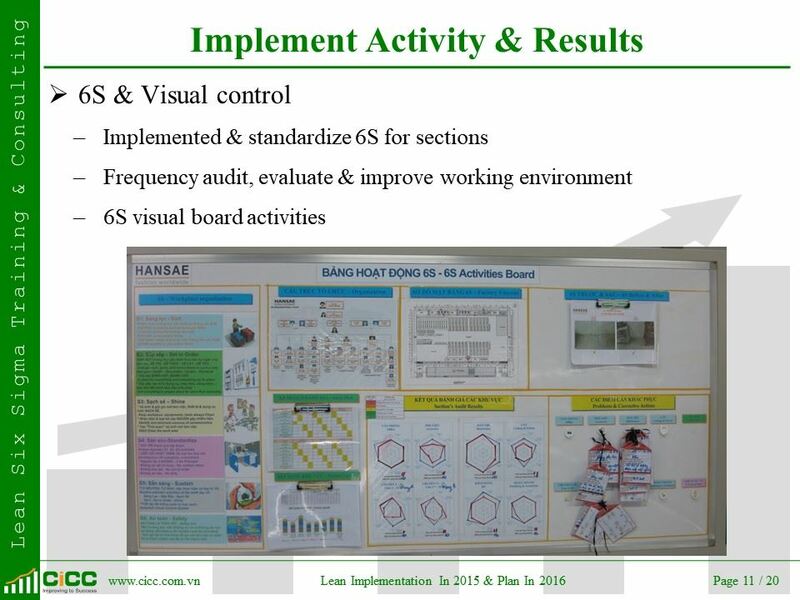 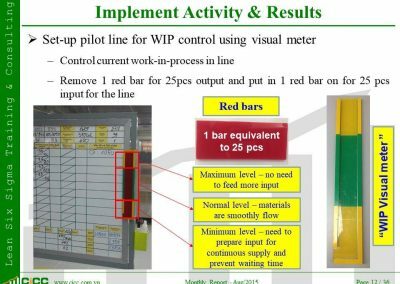 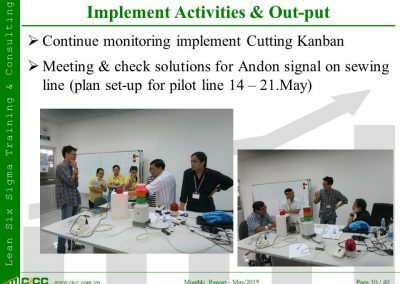 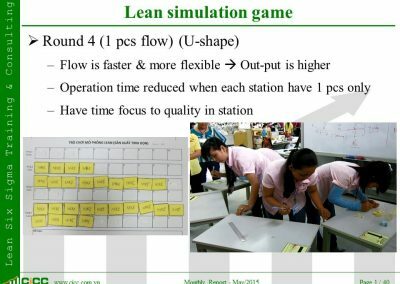 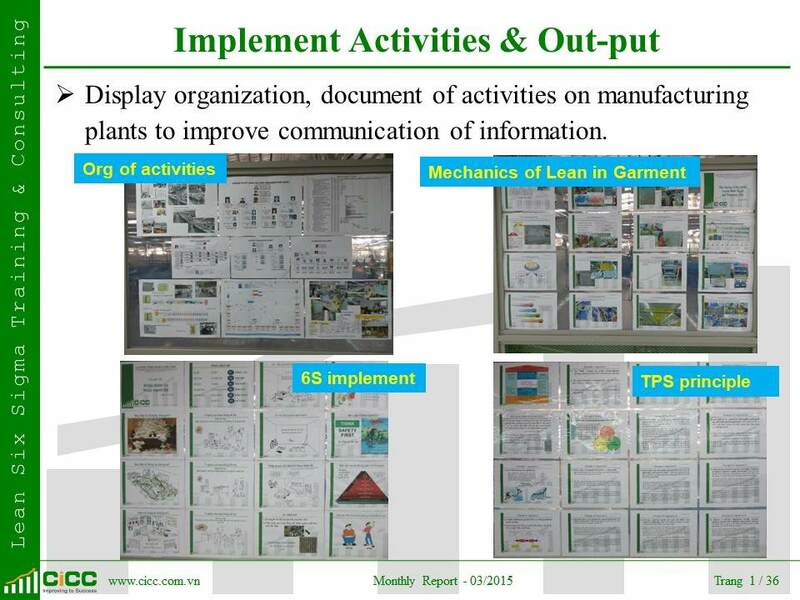 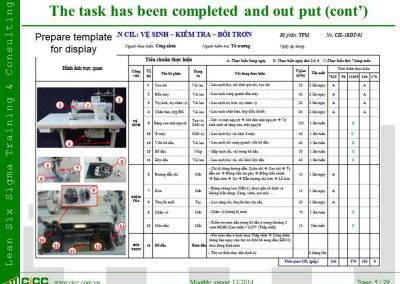 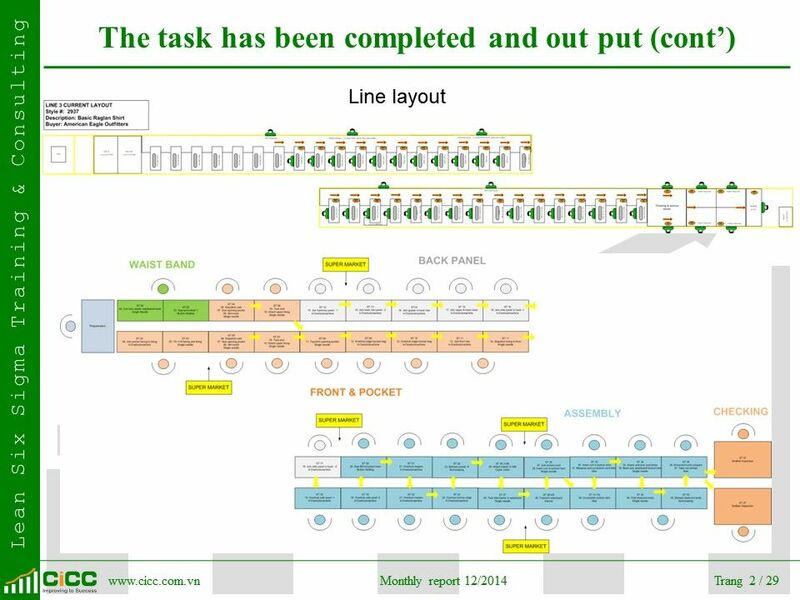 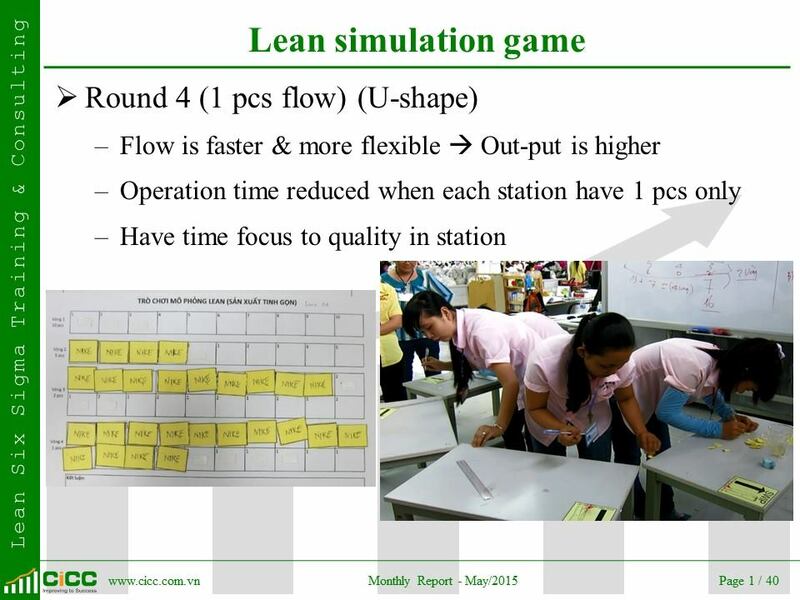 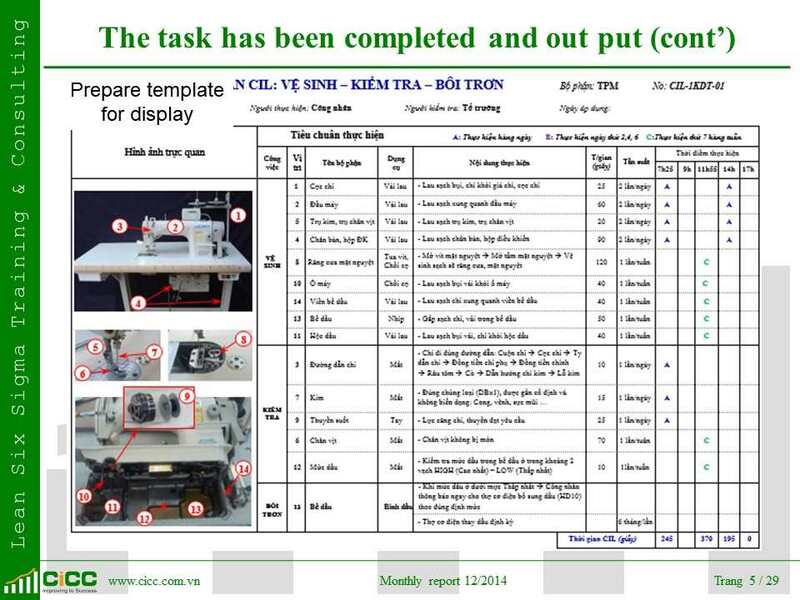 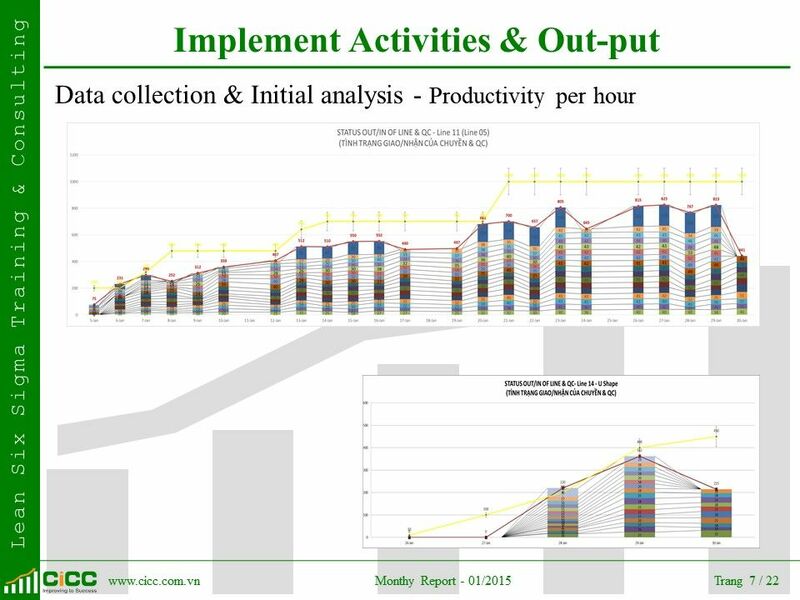 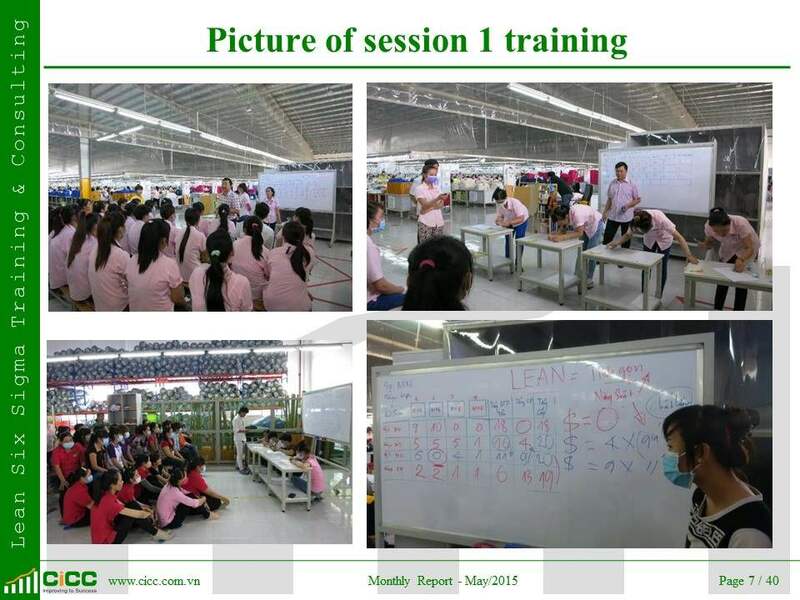 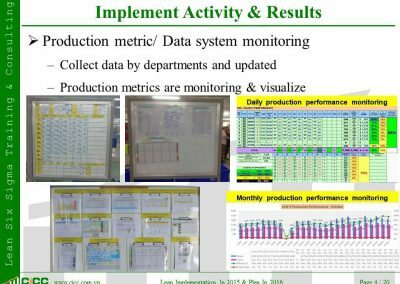 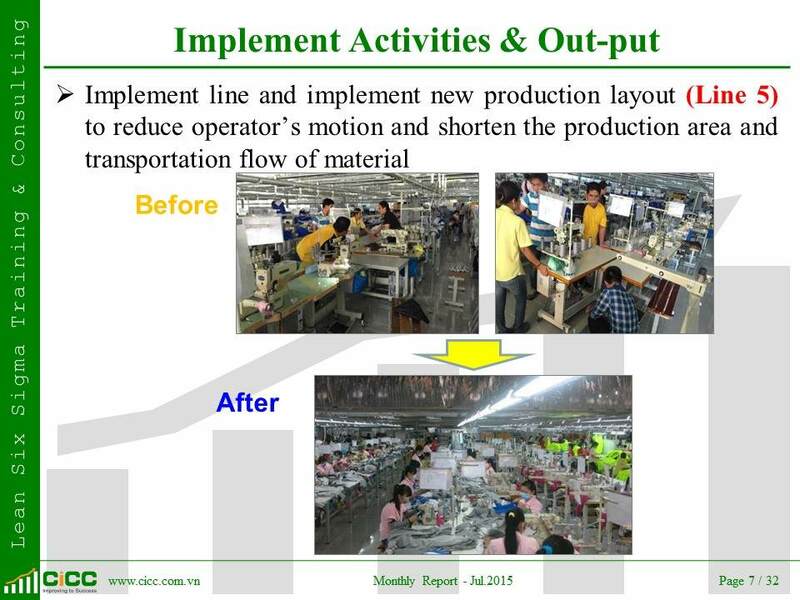 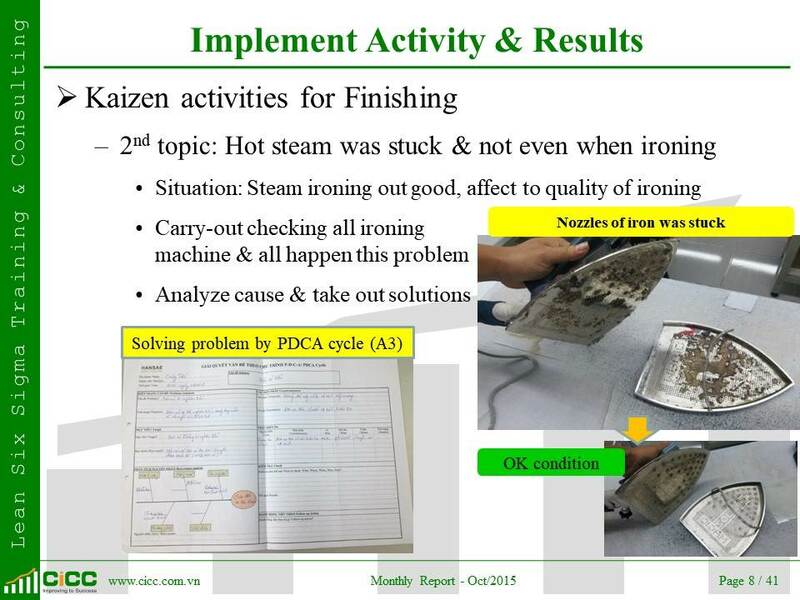 5.1 Introduction of visualization of abnormalities and real time practical problem solving activity at the process. 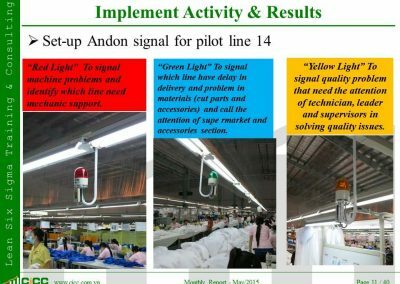 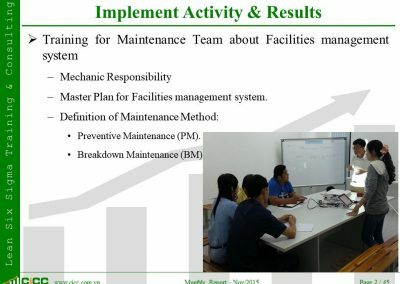 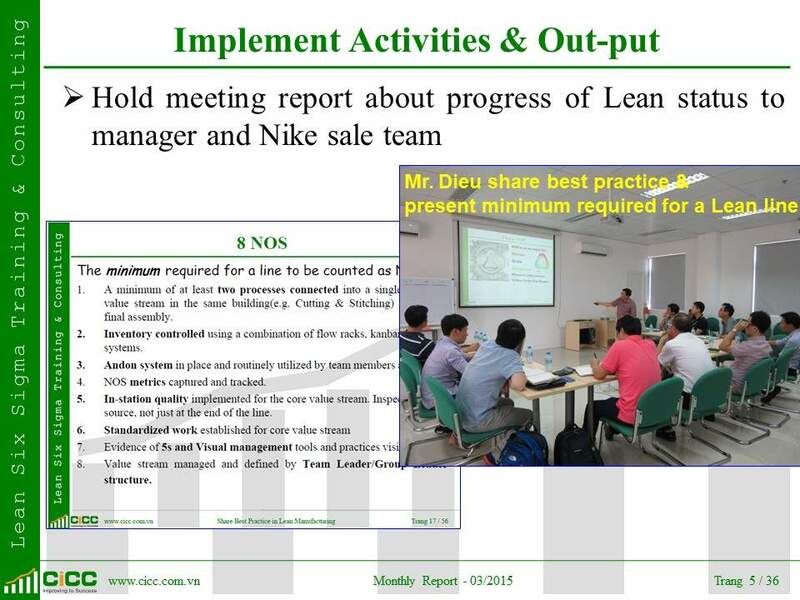 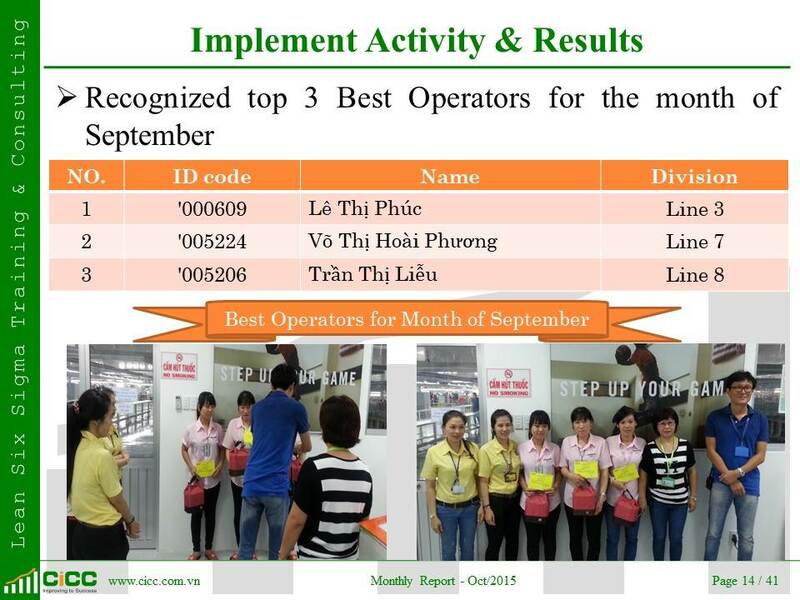 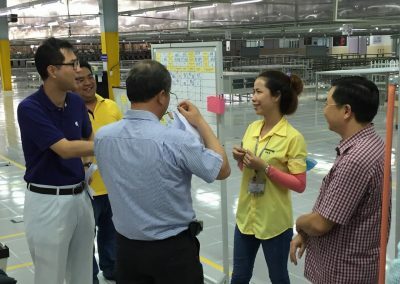 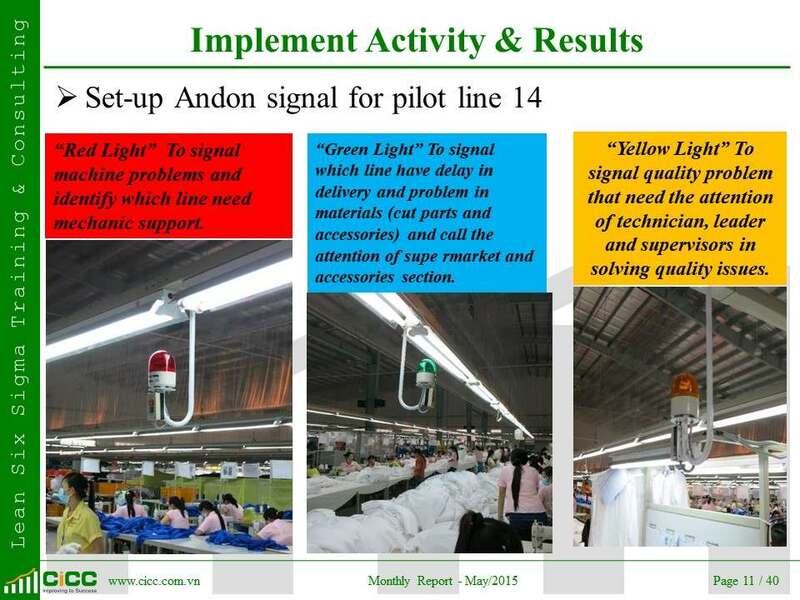 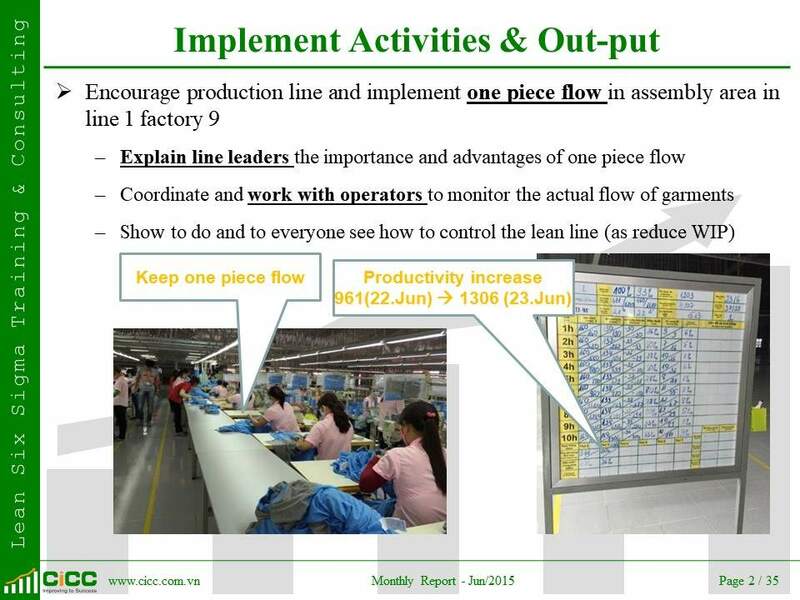 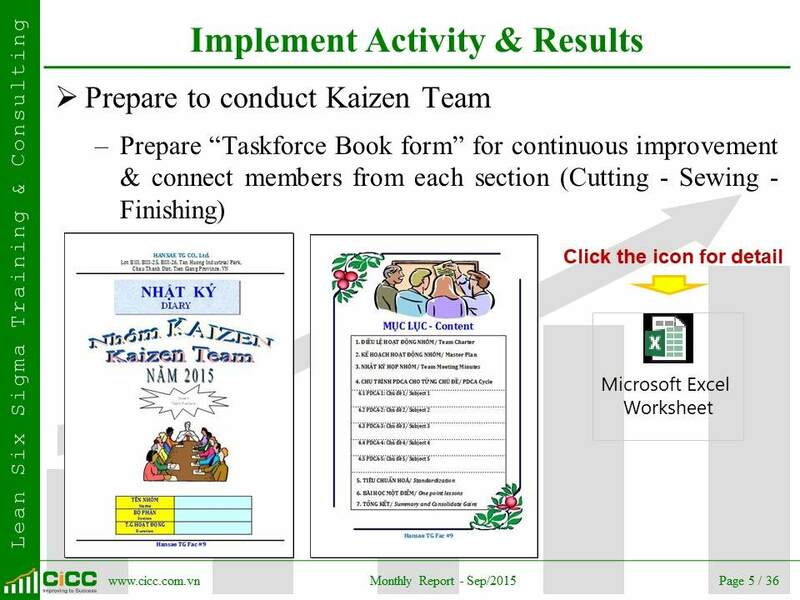 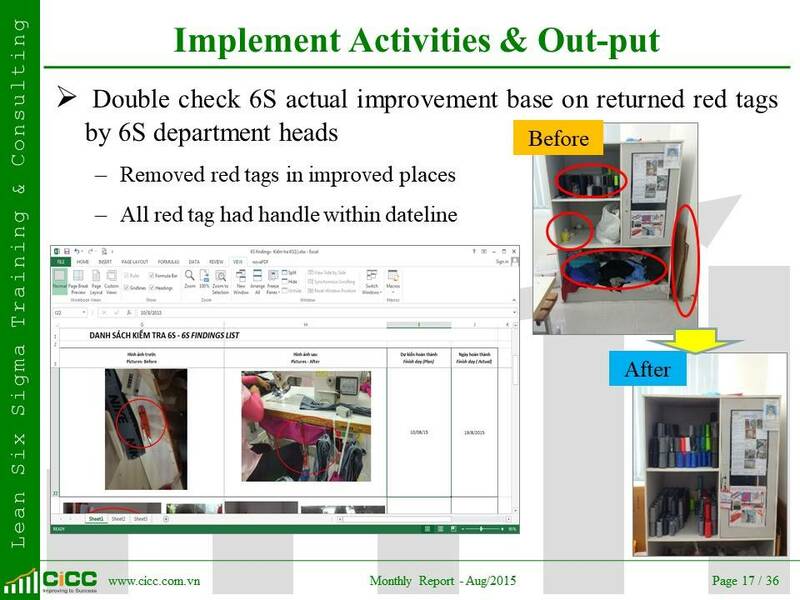 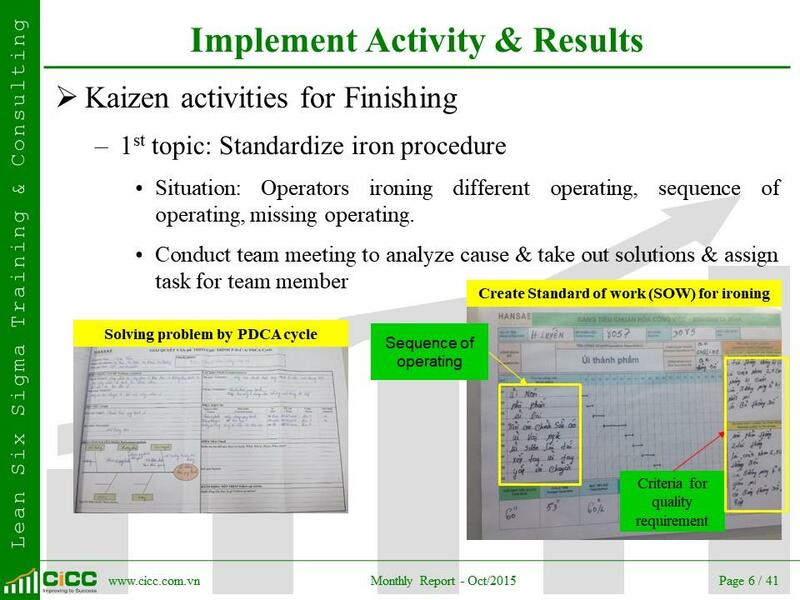 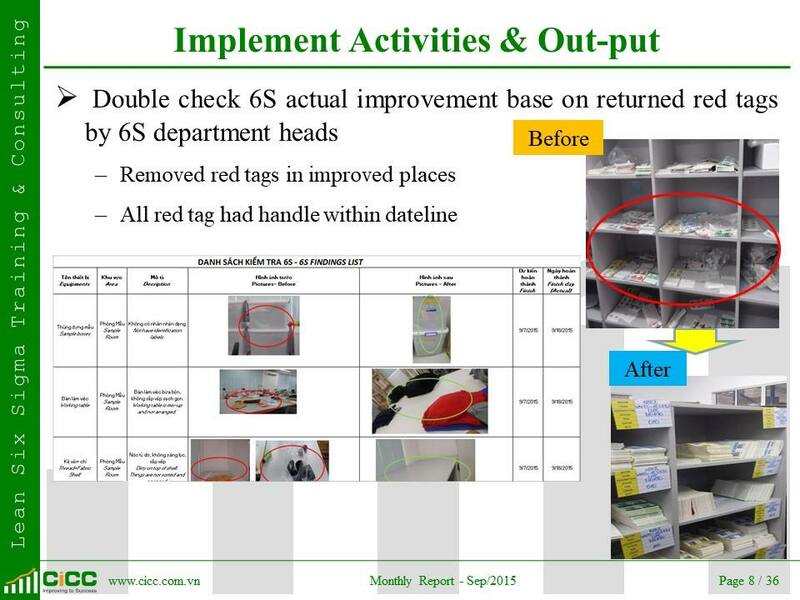 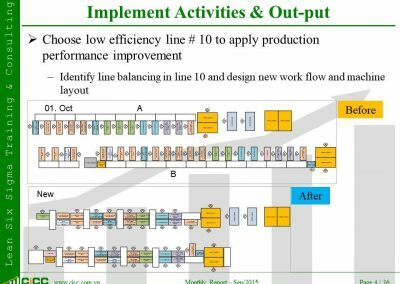 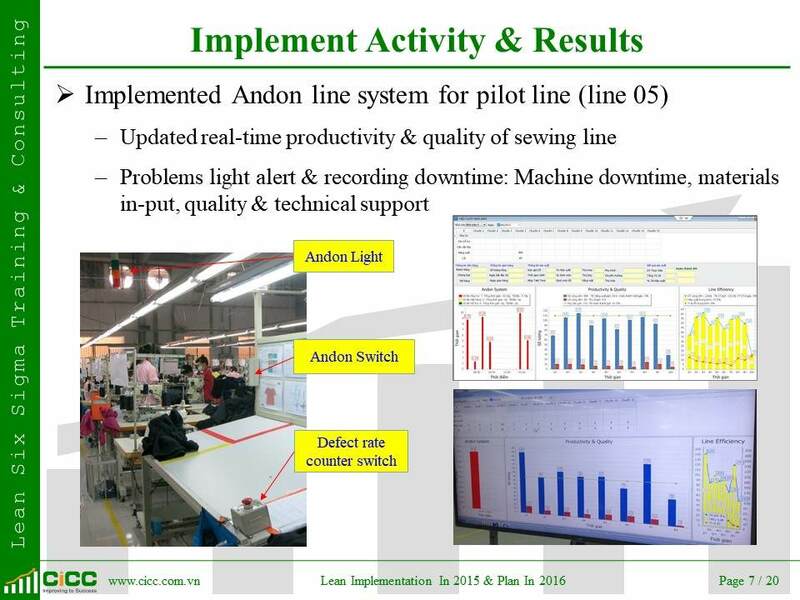 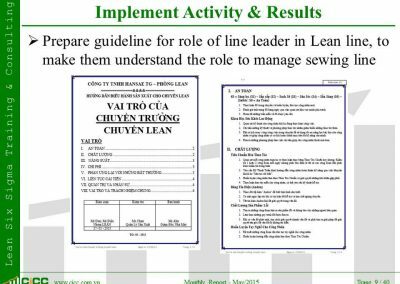 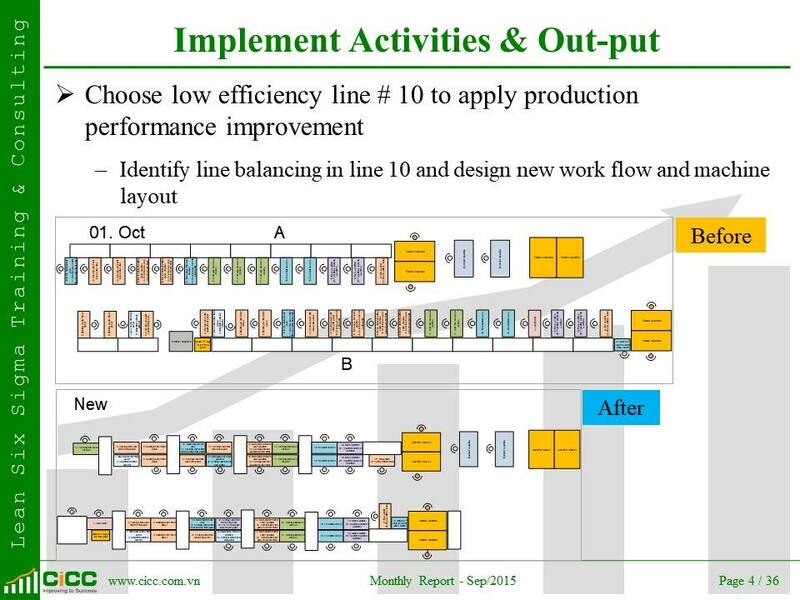 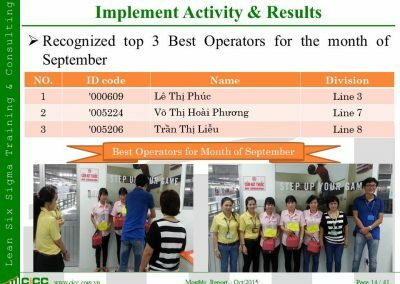 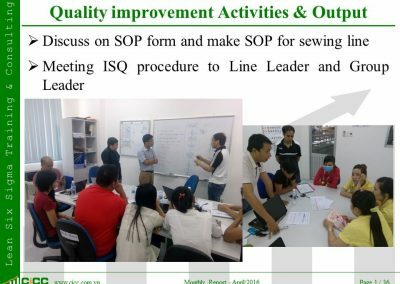 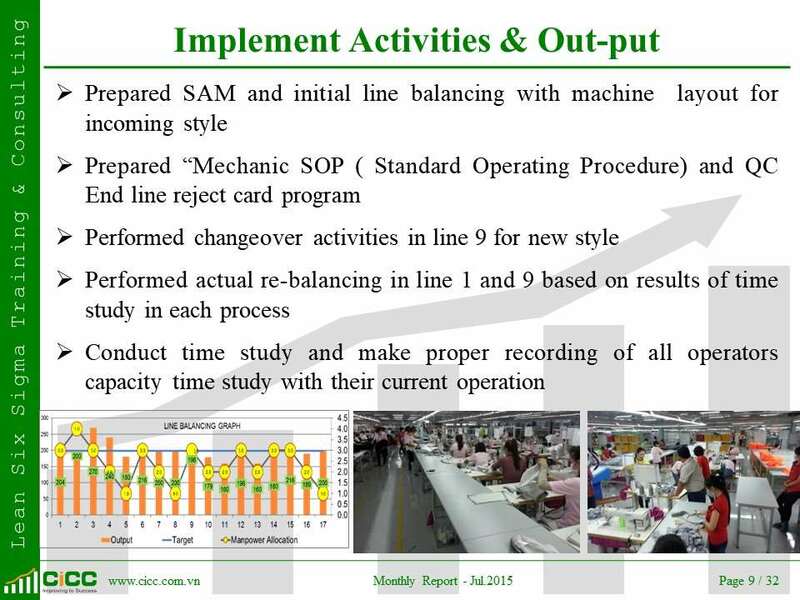 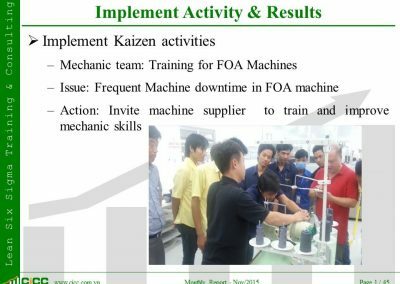 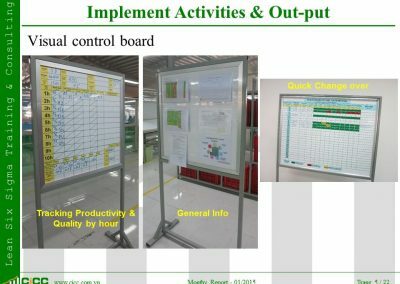 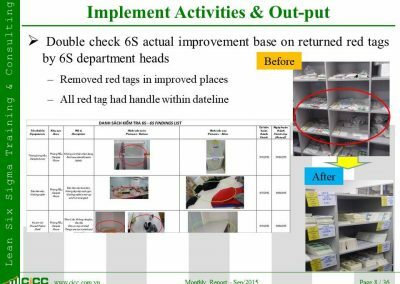 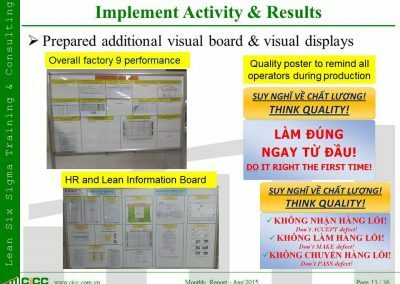 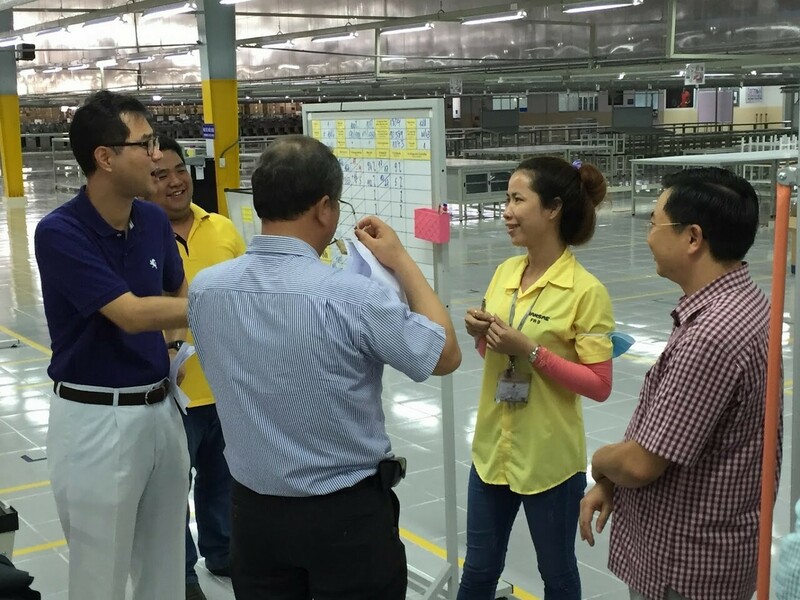 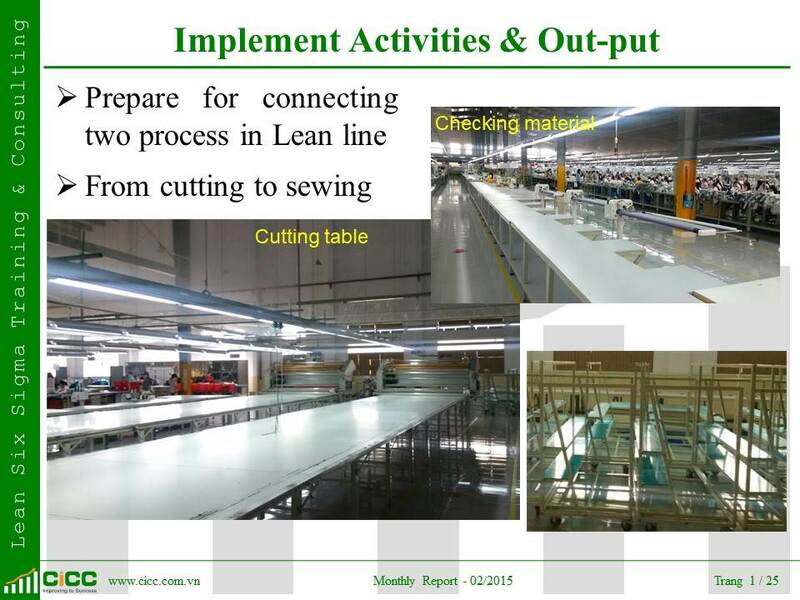 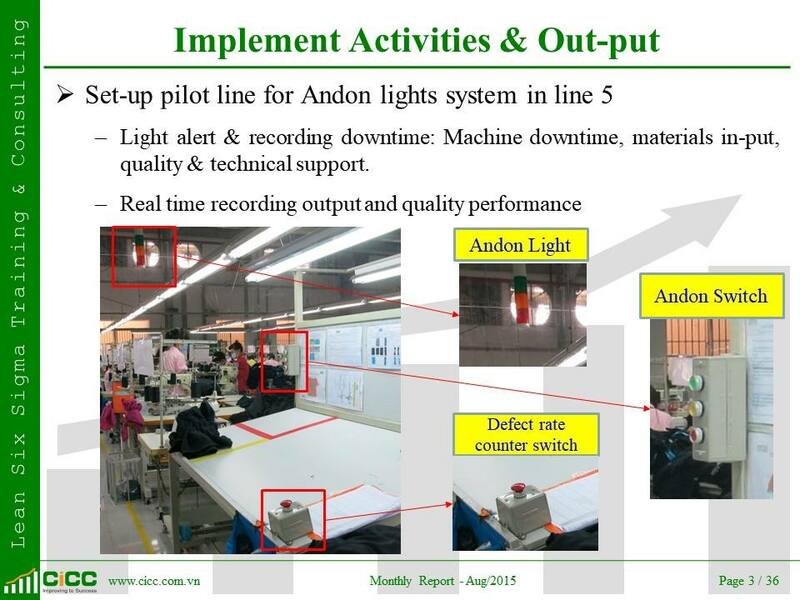 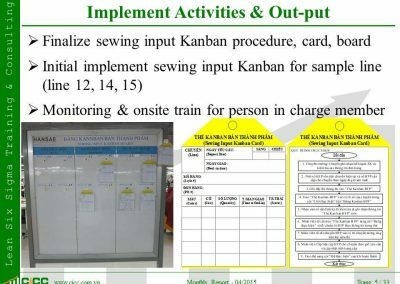 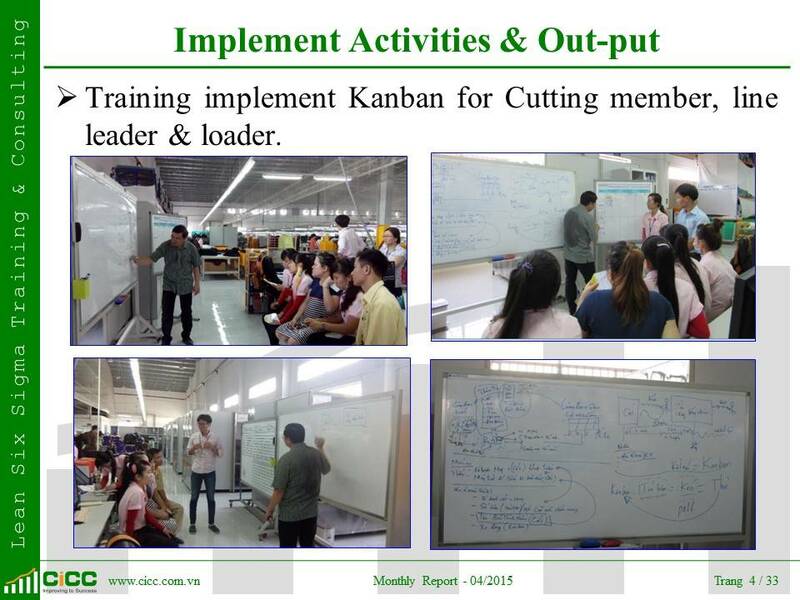 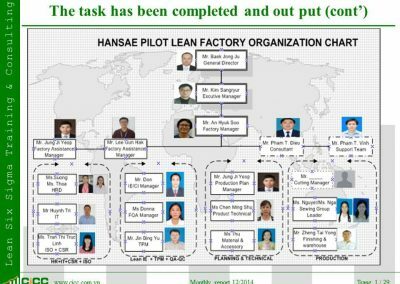 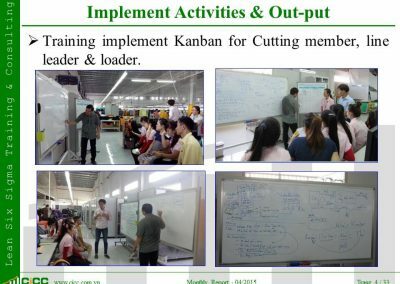 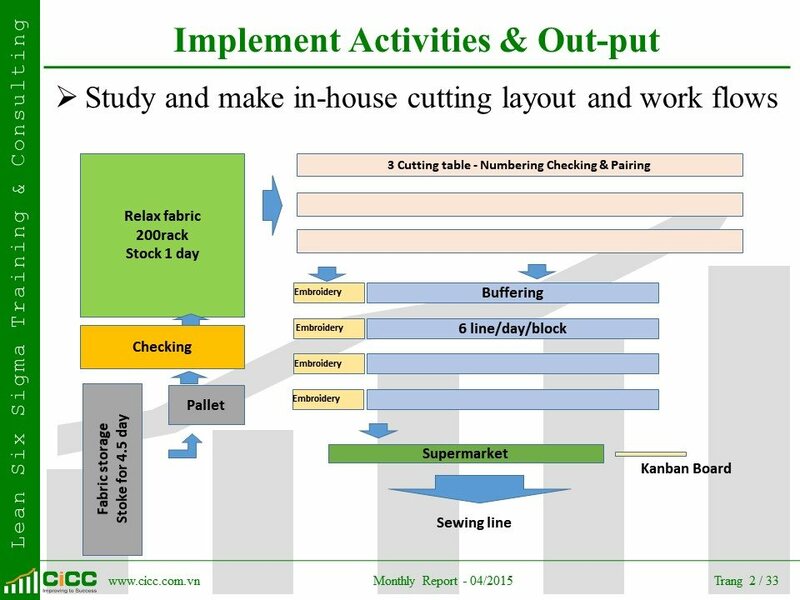 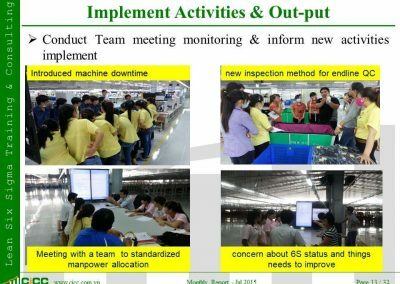 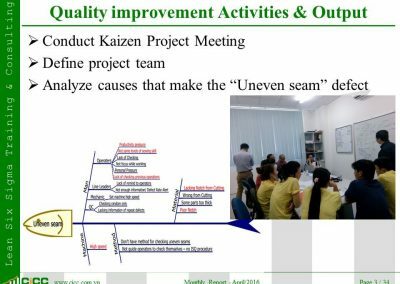 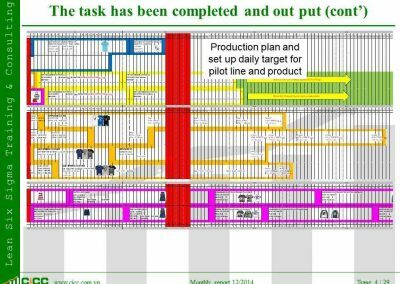 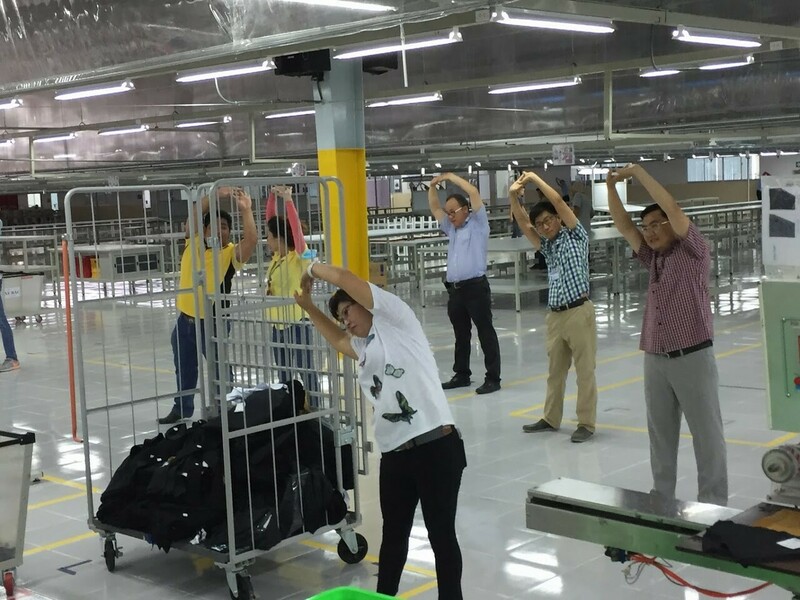 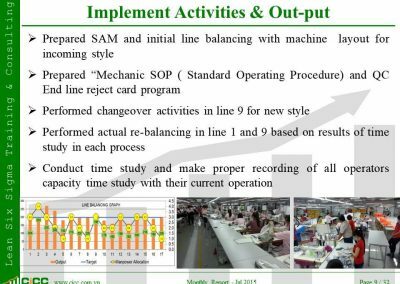 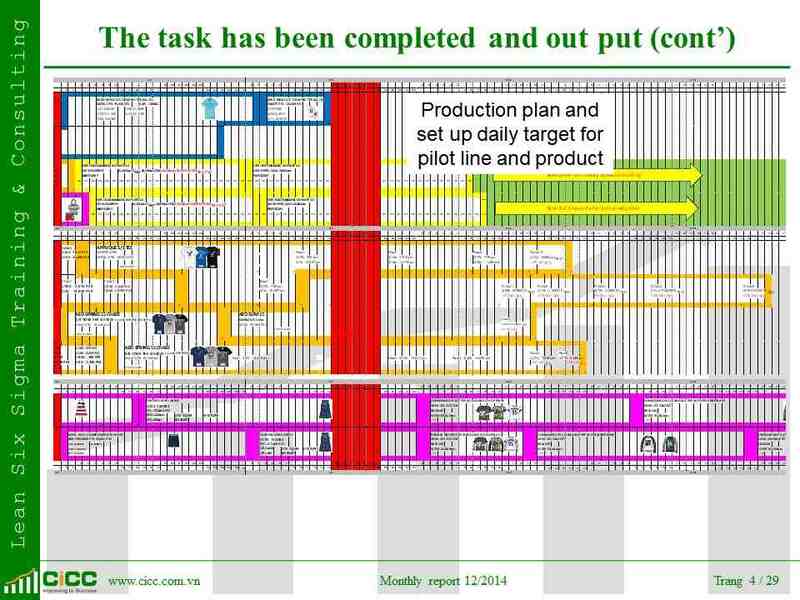 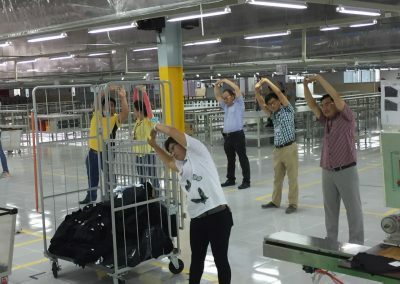 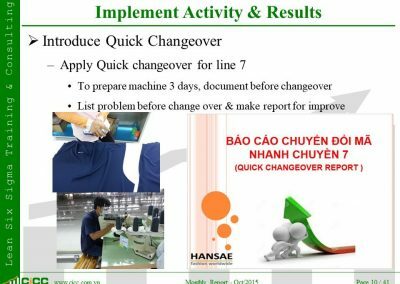 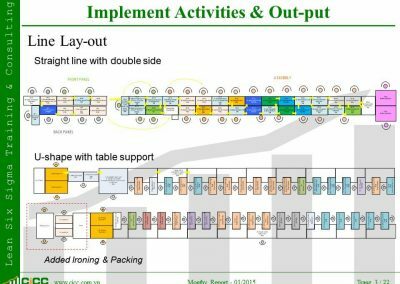 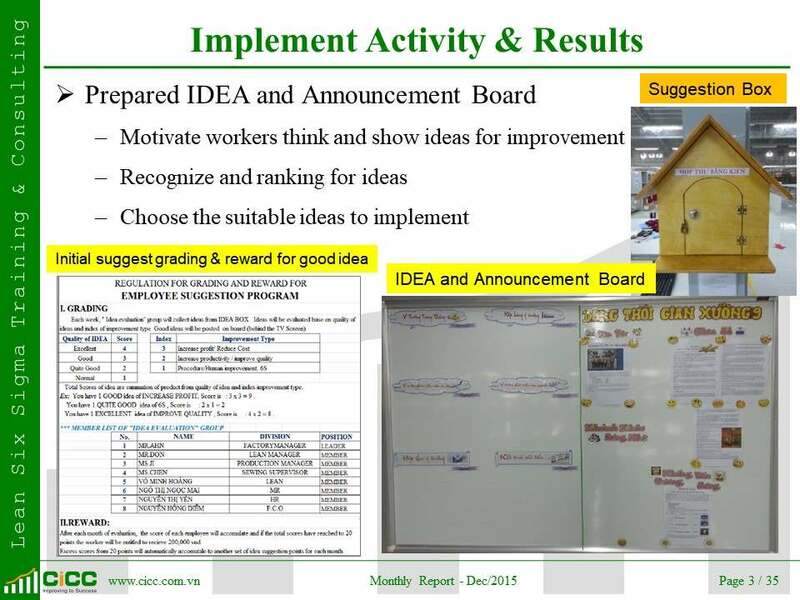 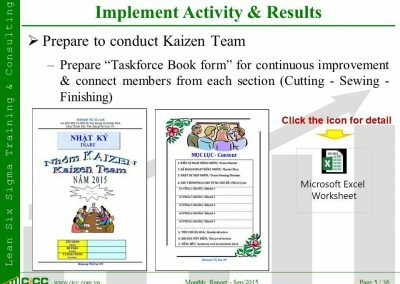 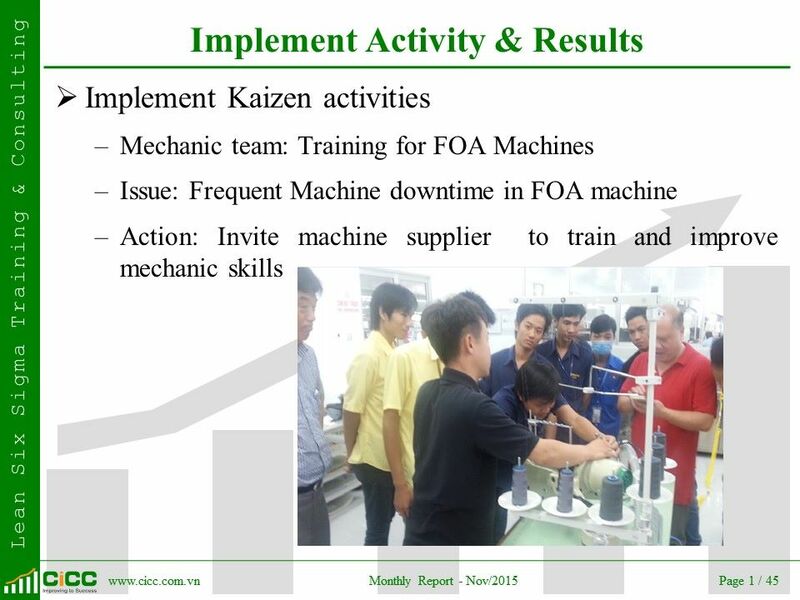 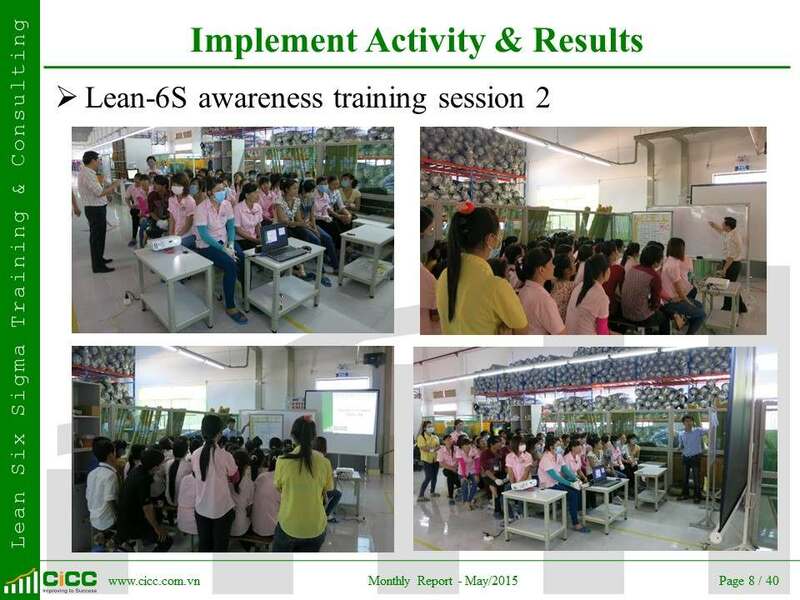 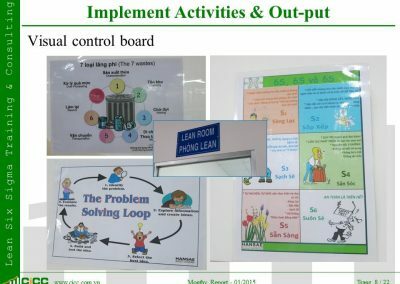 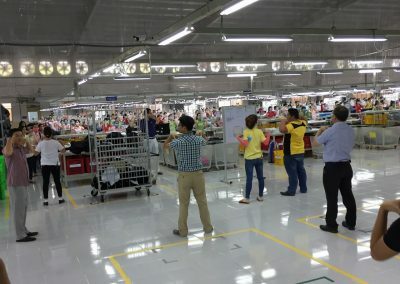 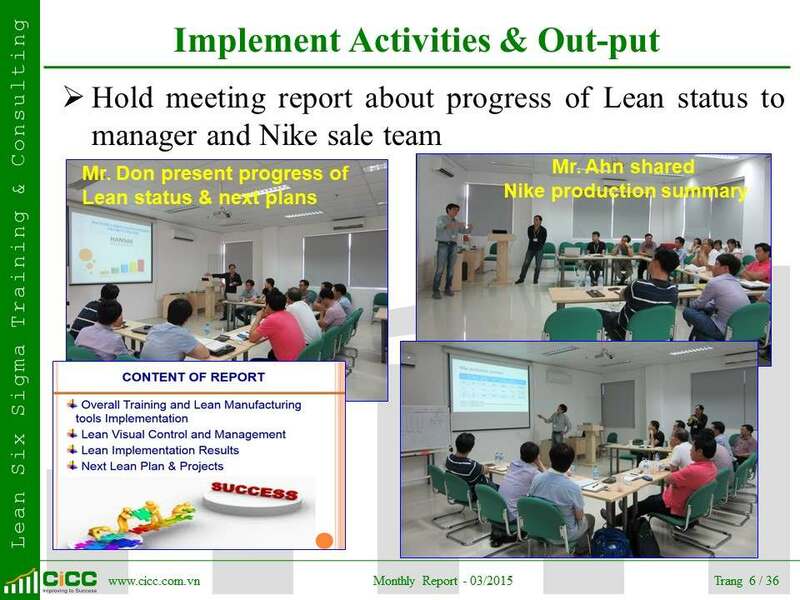 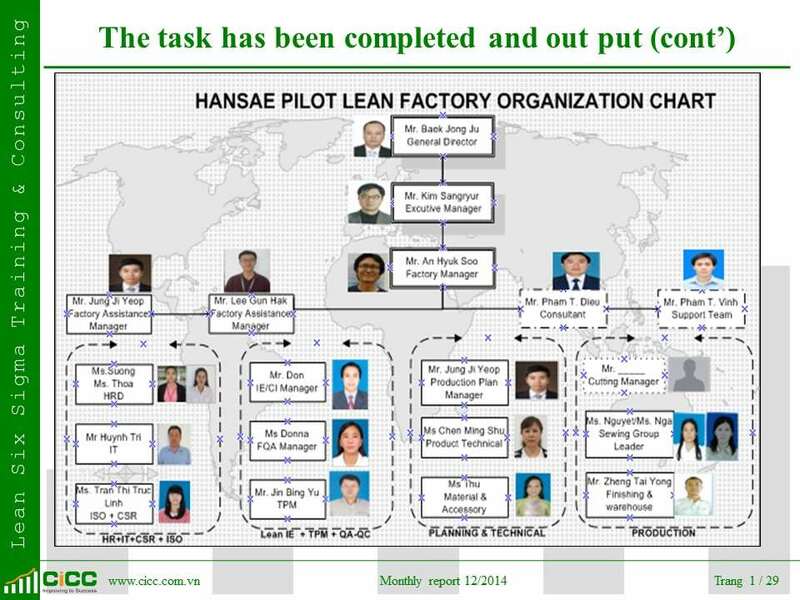 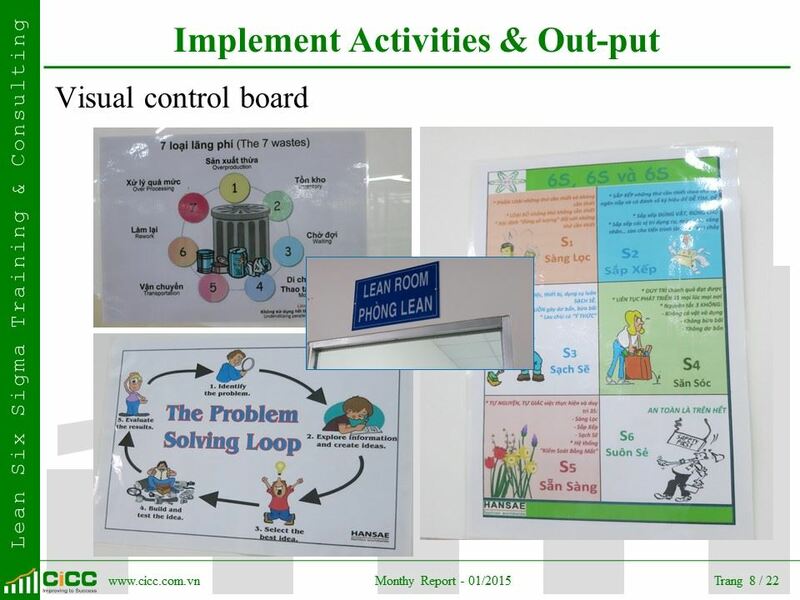 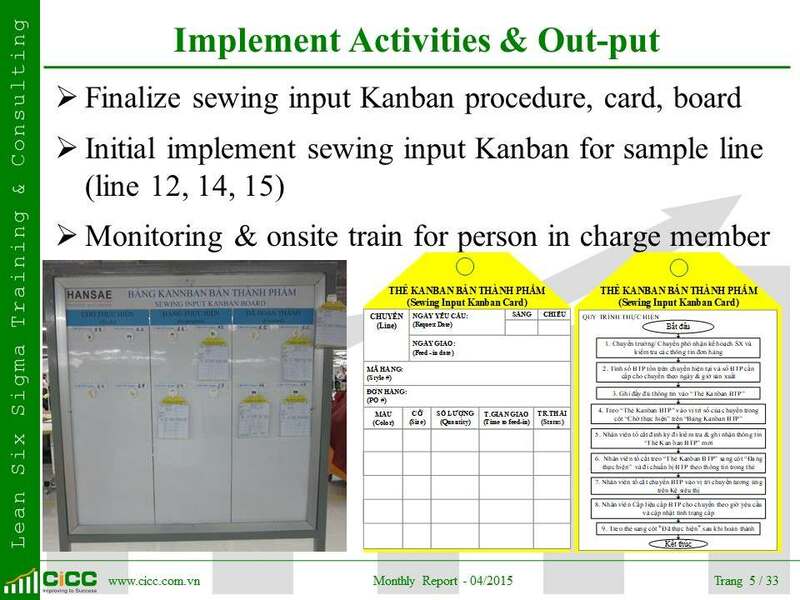 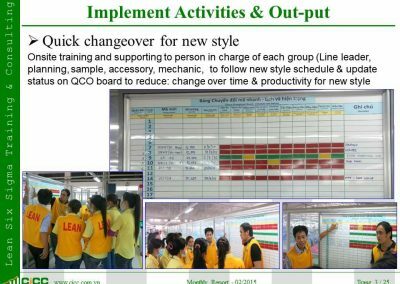 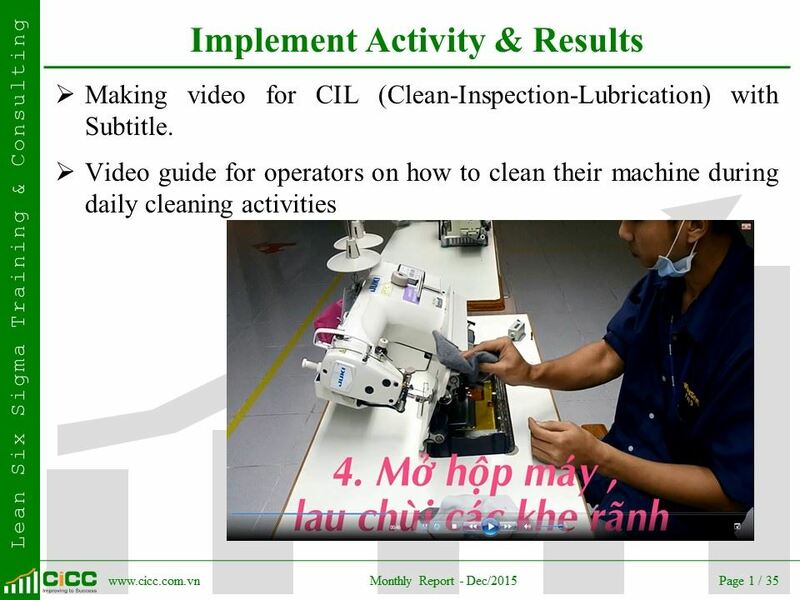 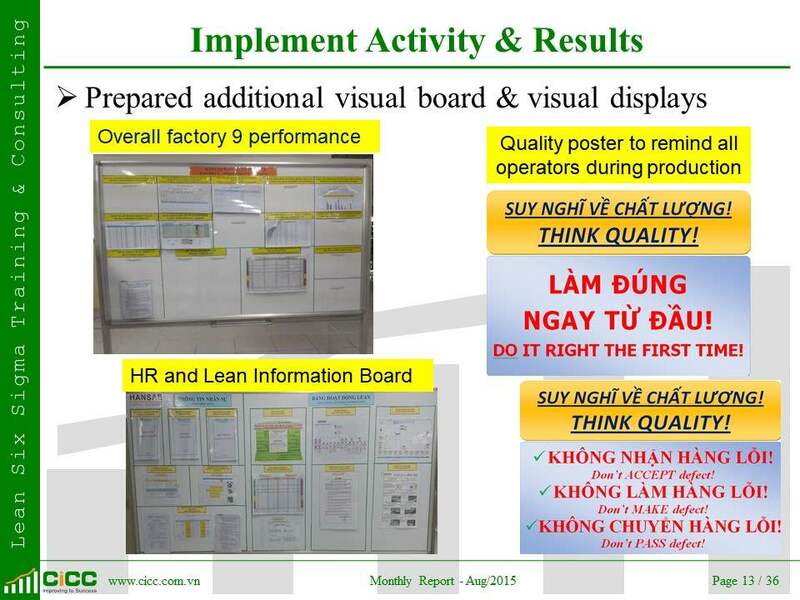 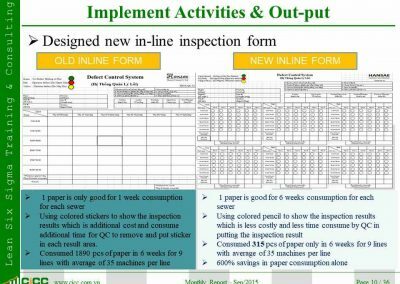 5.3 Daily follow up by Process Leaders to practice the Lean Leadership roles and behaviors. 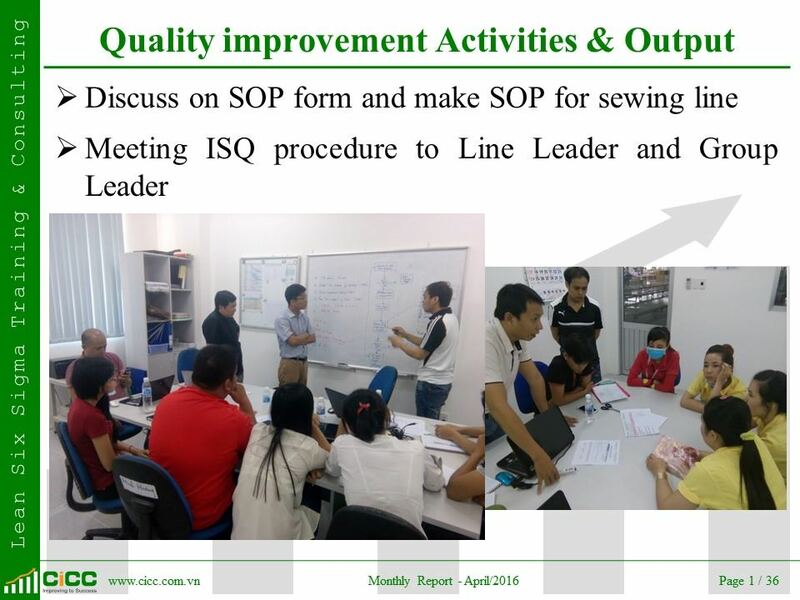 5.4 “Learn by doing” together and reflecting on progress and issues. 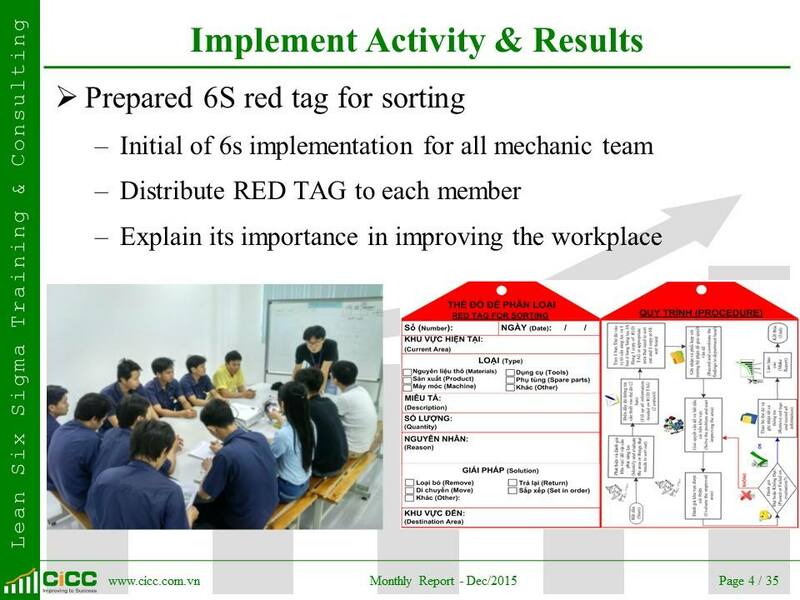 5.5 Continuous communication of activity and results to all employees. 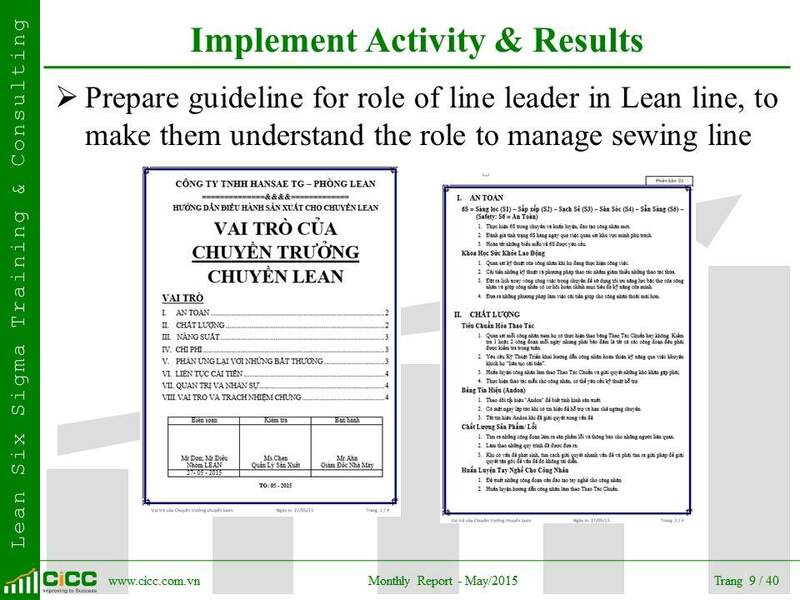 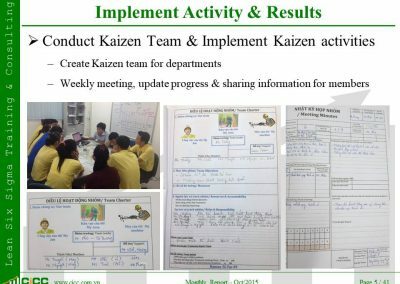 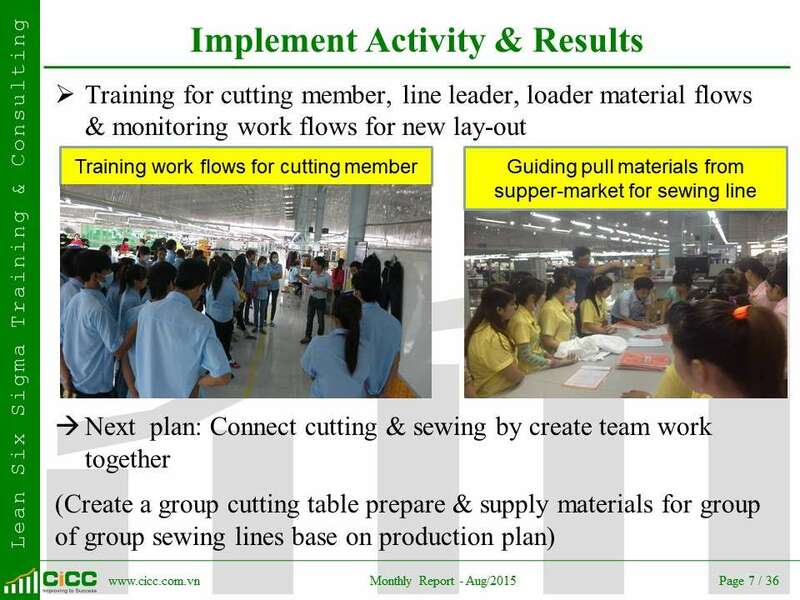 6.6 Daily follow up by Process Leaders to practice the Lean Leadership roles and behaviors. 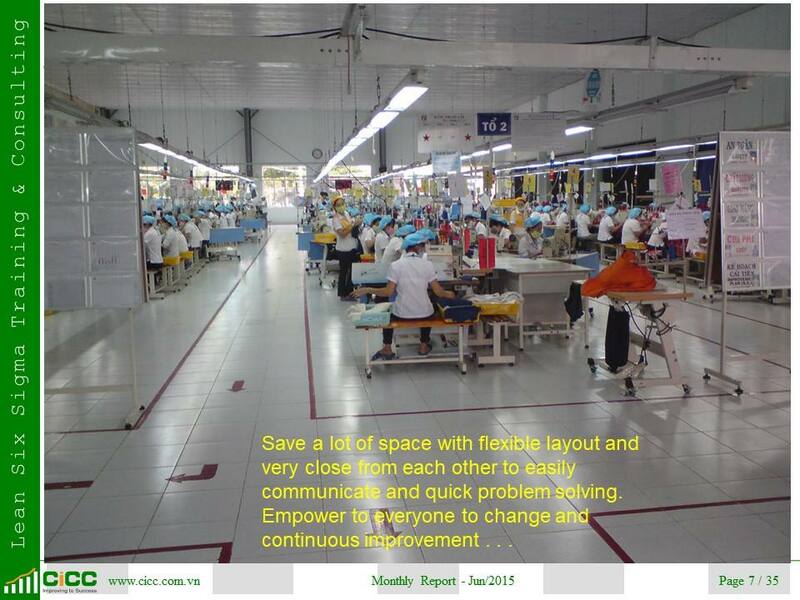 6.7 “Learn by doing” together and reflecting on progress and issues. 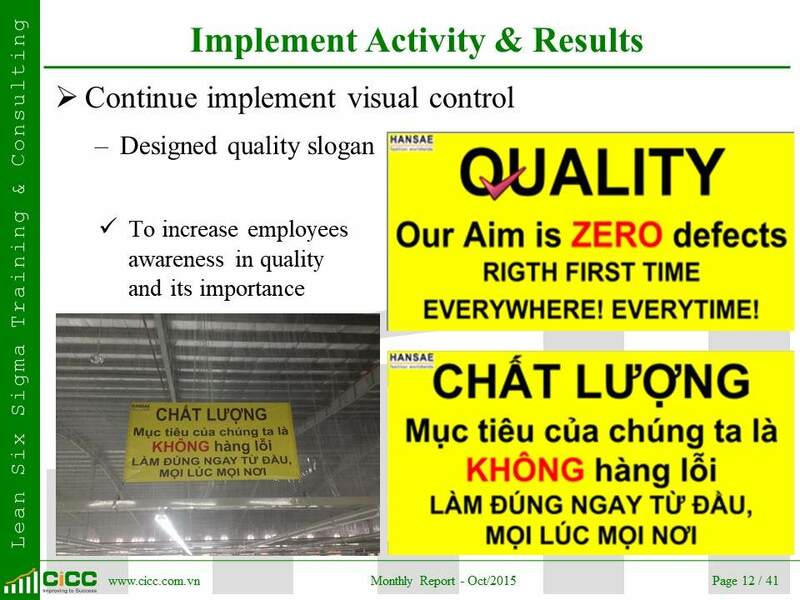 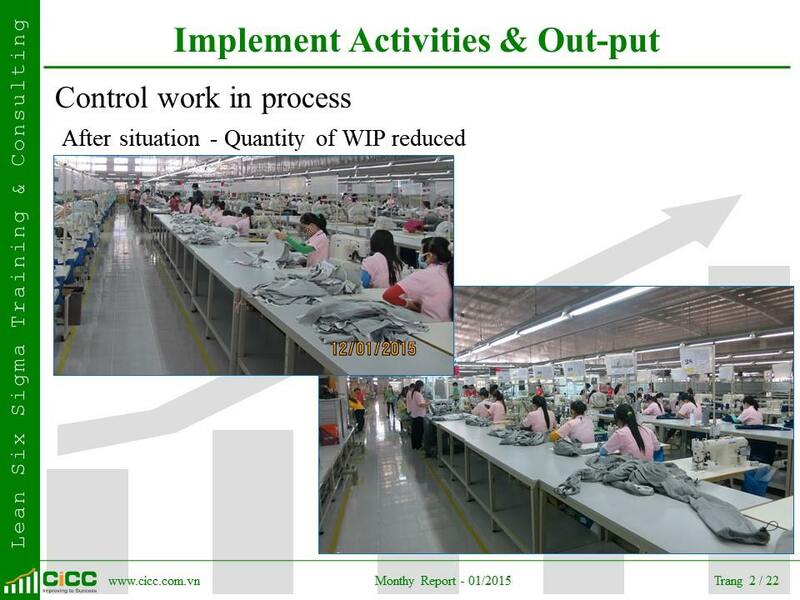 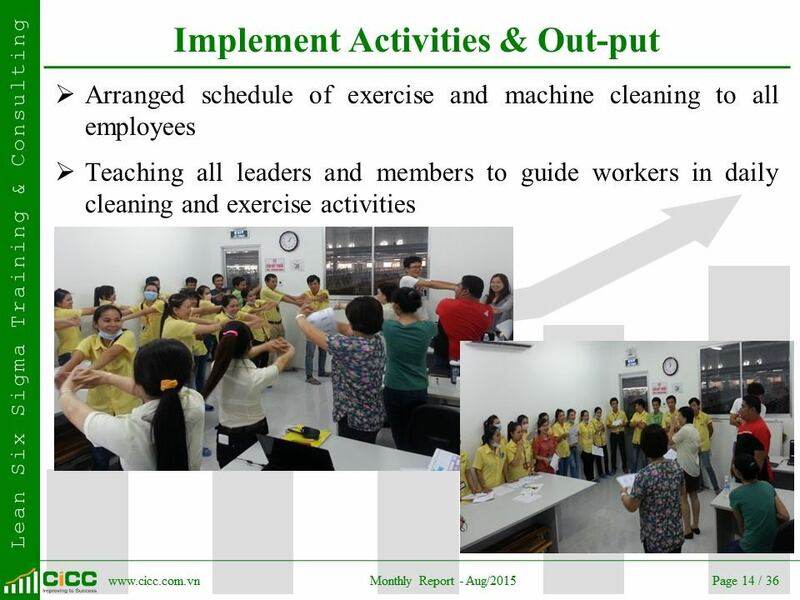 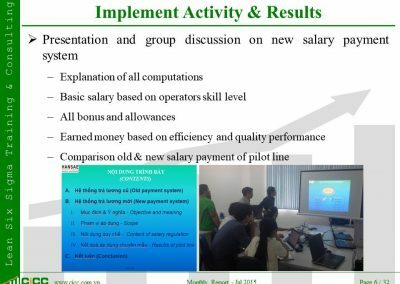 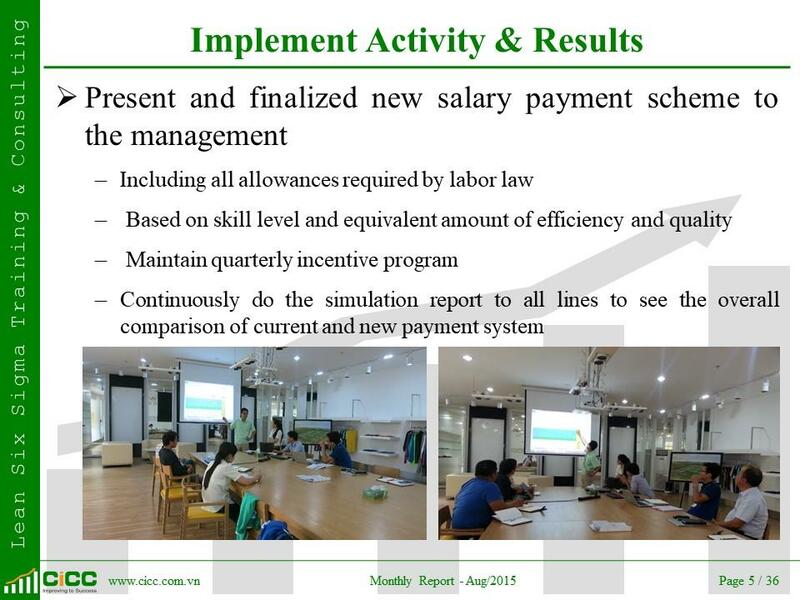 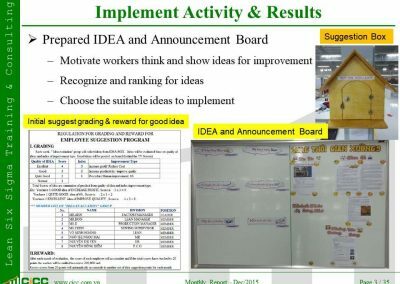 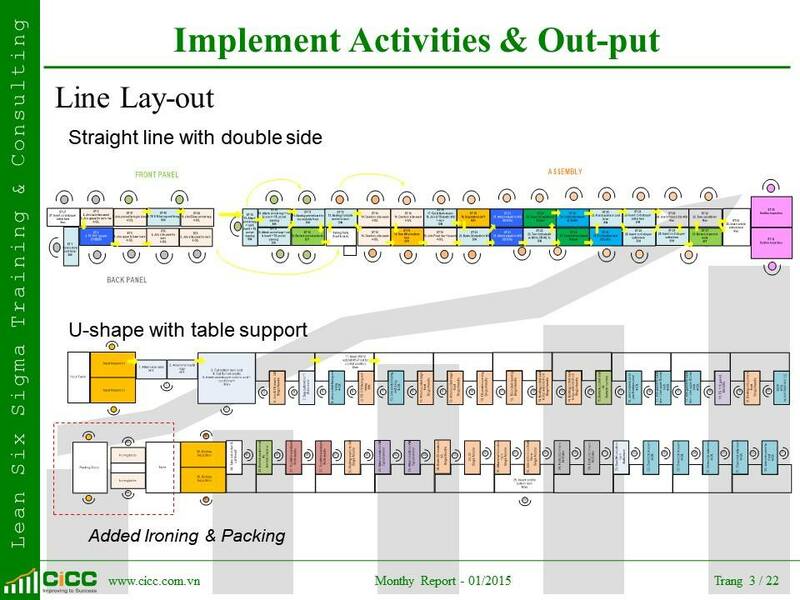 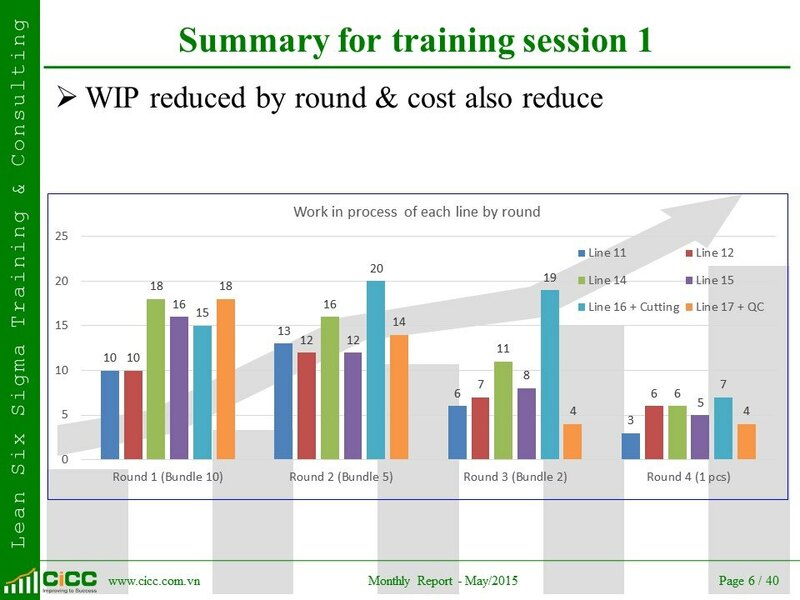 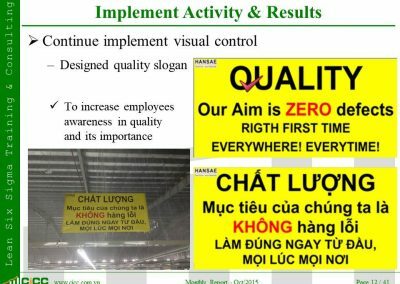 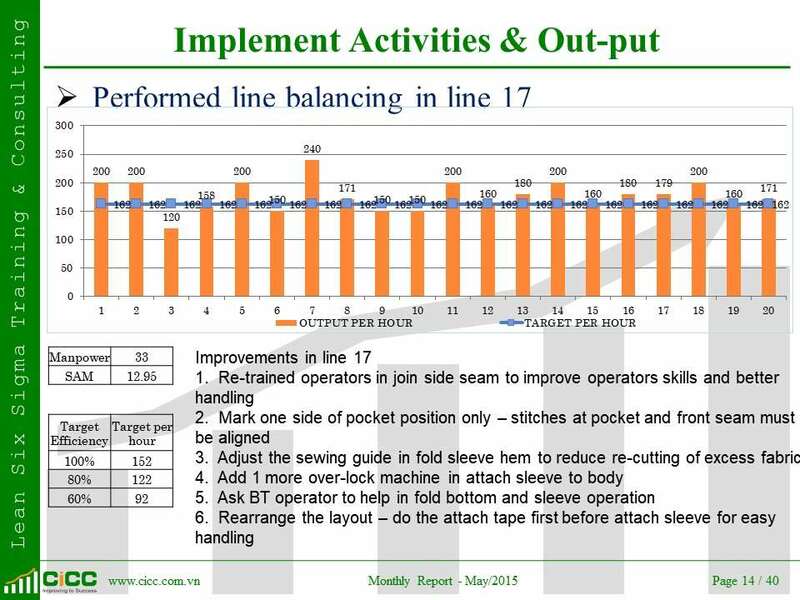 6.8 Continuous communication of activity and results to all employees.